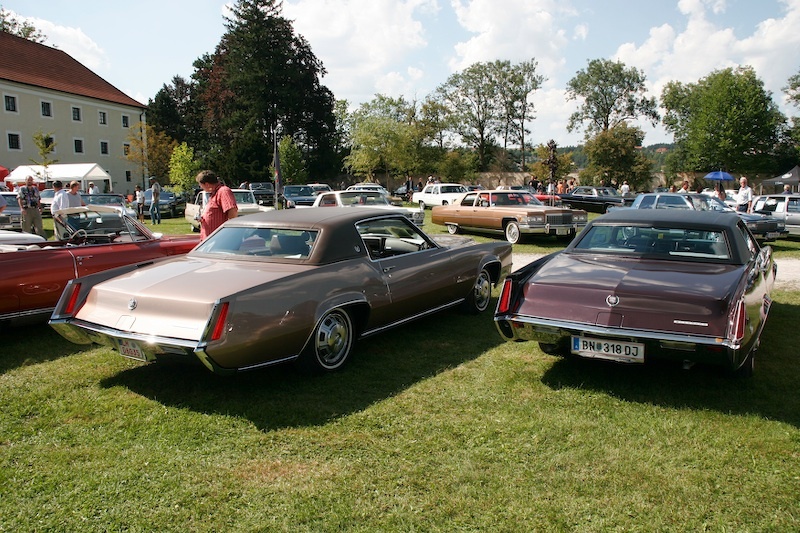 Car Shows | Geralds 1958 Cadillac Eldorado Seville, 1967 Cadillac Deville,1967 Cadillac Eldorado, 1971 Lincoln Continental Mark III and 1978 Cadillac Eldorado Biarritz. 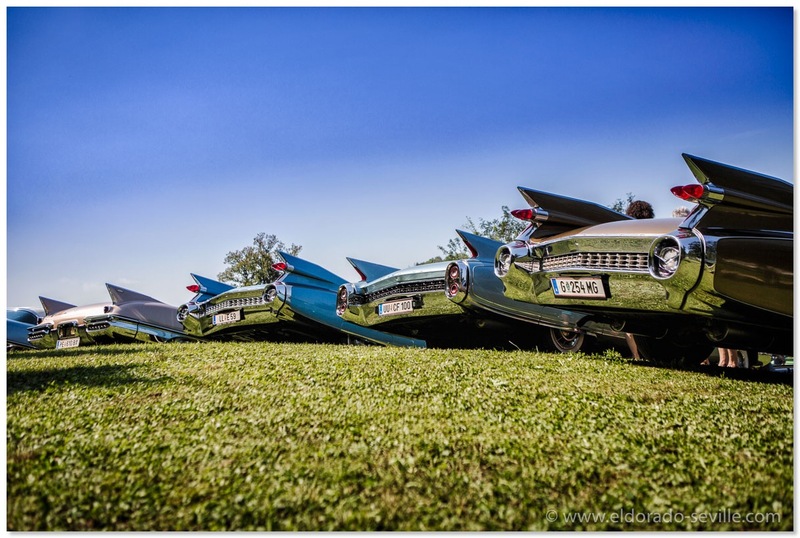 The Cadillac BIG Meet 2016 was featured on 4 different TV stations in Austria. I am in the organization team of the meeting and responsible for media and PR of the event, so I had to give some interviews. One team even visited me and my friend Christian in our garages. You can see the videos of the reports below! Below are two making off pictures I took while the Servus-TV team did its work. The Servus-TV cameraman at work in my garage. 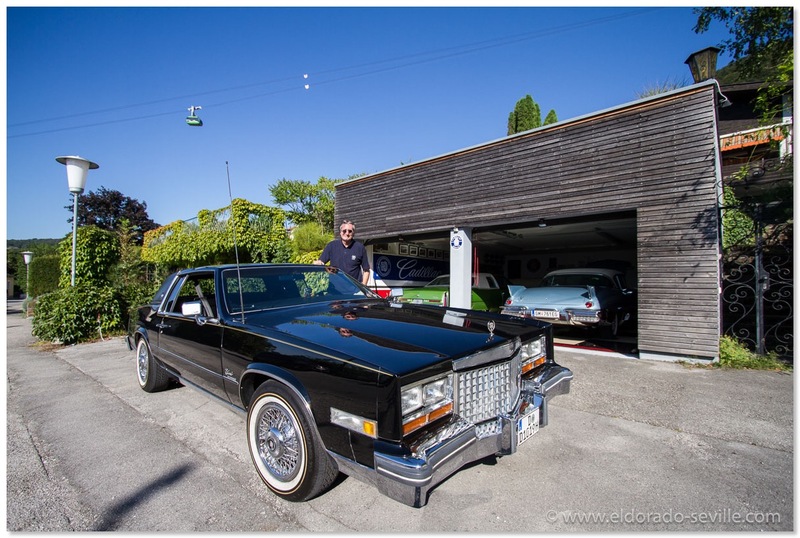 The best and biggest Cadillac Meeting in Europe is just around the corner, and I took a whole week off from work, just to get my cars ready for the show. The theme for the 2016 event is the " Rear Wheel Drive Eldorados from 1953 to 1966" - so I will have to show my 58 Seville there. 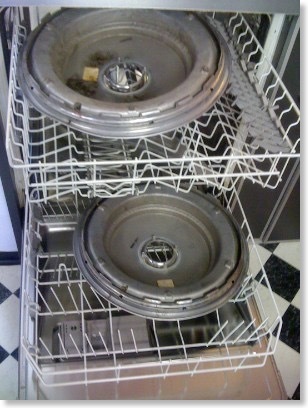 But I will also display my 74, which just returned from the repair shop where I had the wheel housings done. 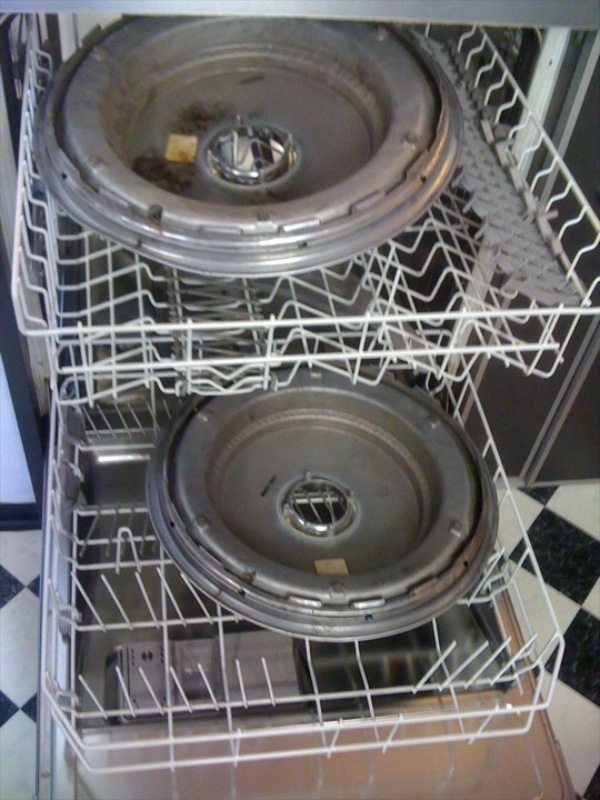 As the car spent many weeks there, it is extremely dirty. 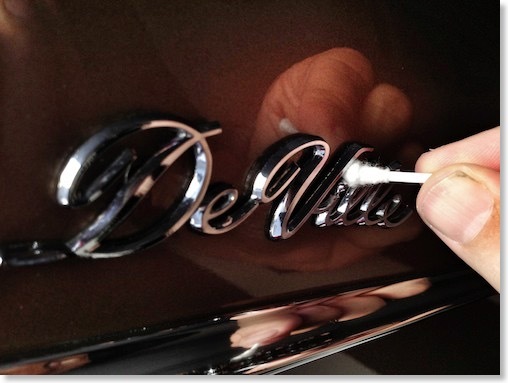 It looked like it was covered with overspray almost everywhere, which is extremely hard to remove. I had to clay the paint numerous times and also had to compound it 2 times and polish it 2 times before I finally could apply a coat of wax. 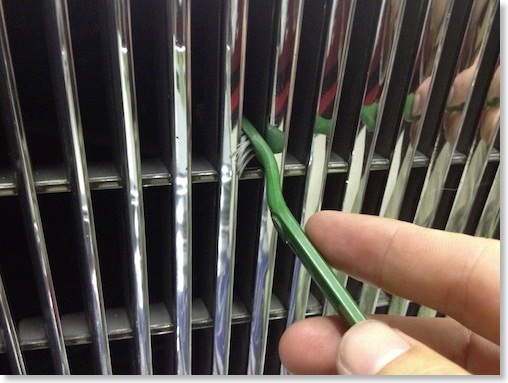 Also all the exterior glass was extremely contaminated, and I had to use glass polish to get it smooth again. I spent 12-16 hours a day, for 4 days in a row with almost no breaks, trying to get the car as clean as possible. I do really work fast, and I could not get it to the level of cleanliness I would have liked, but not many people will notice the areas I could not finish ;-) Looks like I will have to spend next winter to get it as clean as I want it to be. 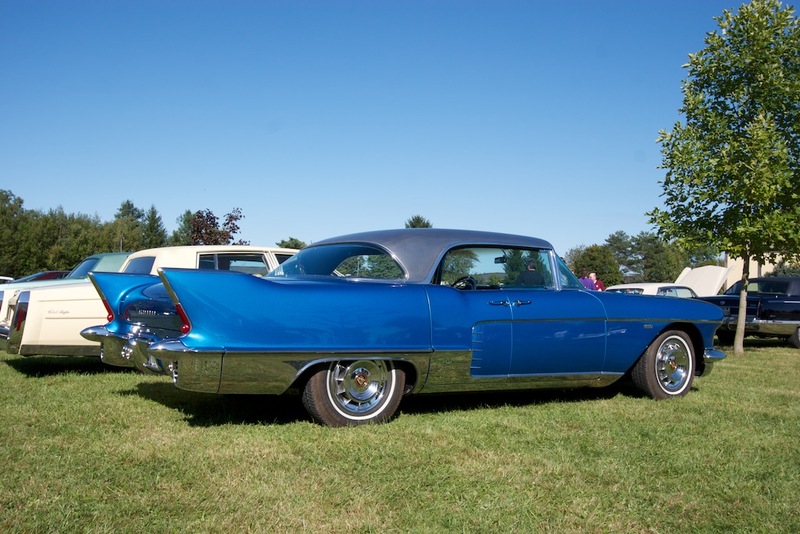 I am looking forward to the Cadillac BIG Meet now! 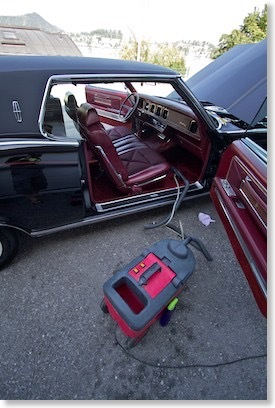 I will drive the 58 Seville and my wife will take the 74 together with my son to the show, as the 58 has no seat belts. 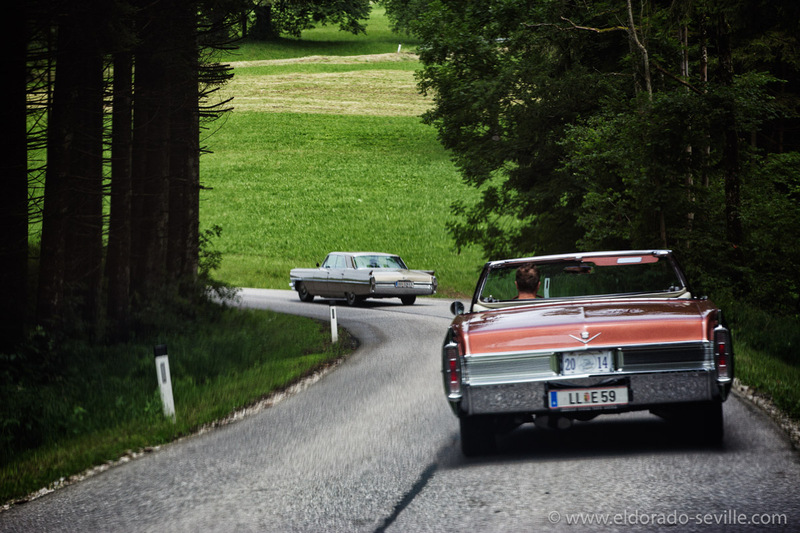 Manuel was one of the first to drive his Eldorado to the Cadillac BIG Meet this year all the way from Düsseldorf. On his way he stopped by my garage and I gave him tour and showed him my humble collection. 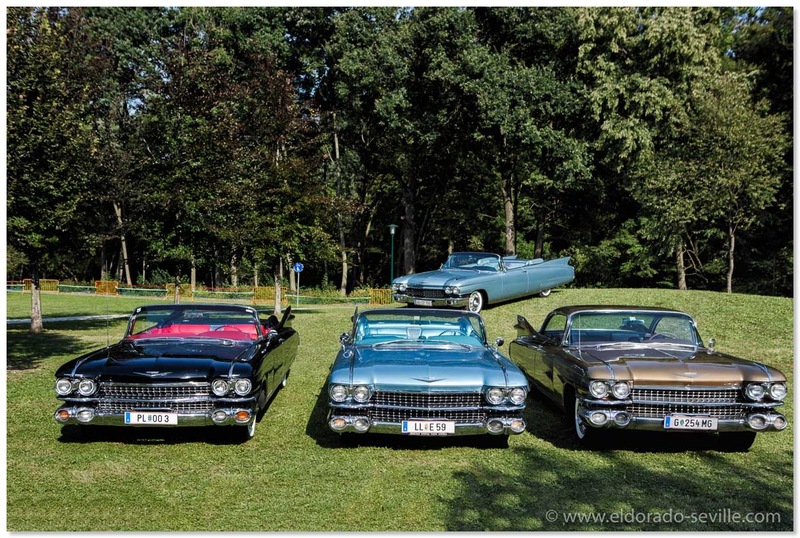 I´m a proud member of the organization team of the Cadillac BIG Meet, which is Europe´s biggest Cadillac Meeting. 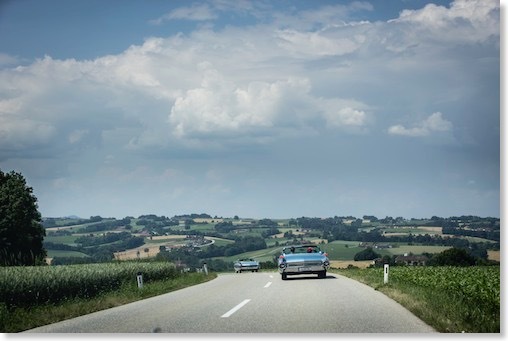 On the day before the meeting we always organize a Driving Tour with about 50 cars participating. Today out team tested the tour in advance of the actual event on August 25th 2016. 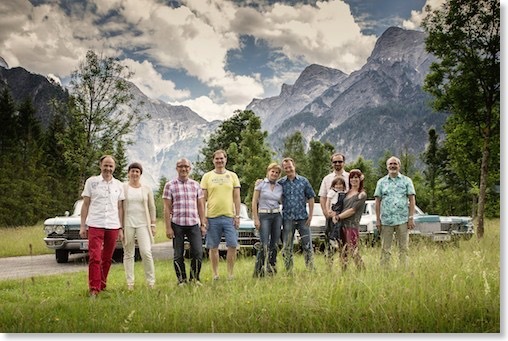 We drove up a nice mountain - the "Gmundnerberg" in the "Salzkammergut" where we will have lunch. All cars in our little convoy made it without a problem. 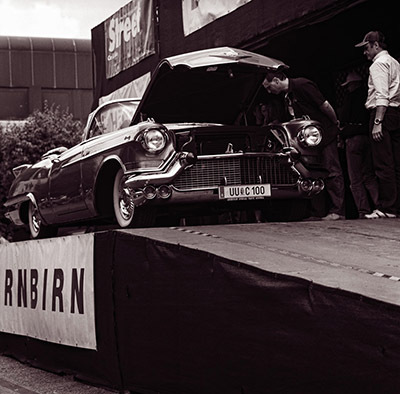 The US-CAR-SHOW in Dornbirn is held every second year and is Austria's finest car show. 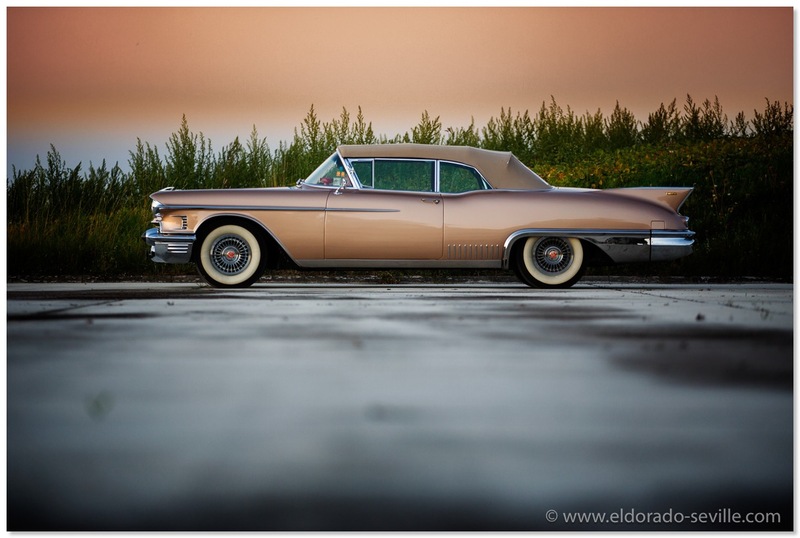 I exhibited one of my Cadillacs at the indoor show in the past years, but this year I decided to take the Roadmaster for the trip and just take part as a regular visitor. The show itself is a class of its own. 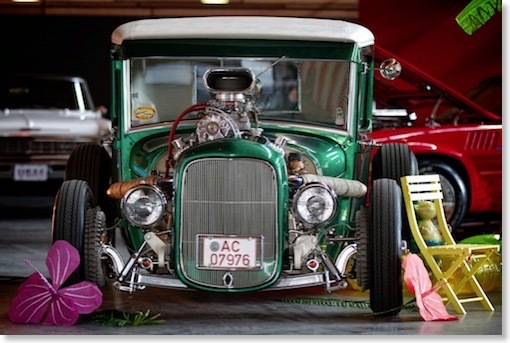 You can find hundreds of Hotrods, Classics and Muscle Cars there which you do not see at any other shows in Austria. We really had a great time there and are looking forward to the next edition of the show in 2015. I did not take many pictures this year - a few of them will be online on my site soon ! 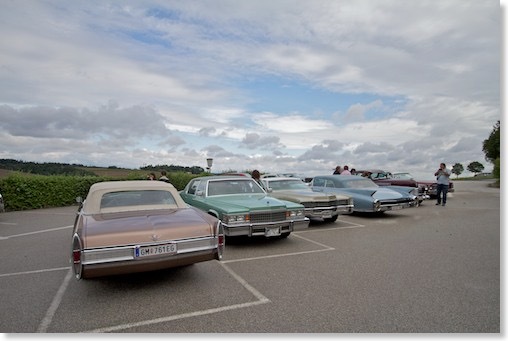 Cadillac BIG Meet 2012 - Bad weather but great cars. 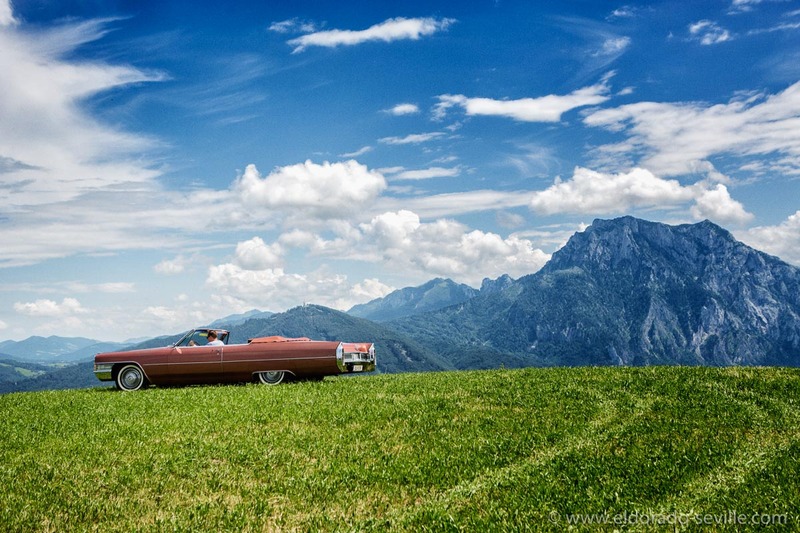 Kremsmünster, Austria – In its 110 year history, Cadillac built more iconic vehicles than any of its competitors in the luxury car segment. 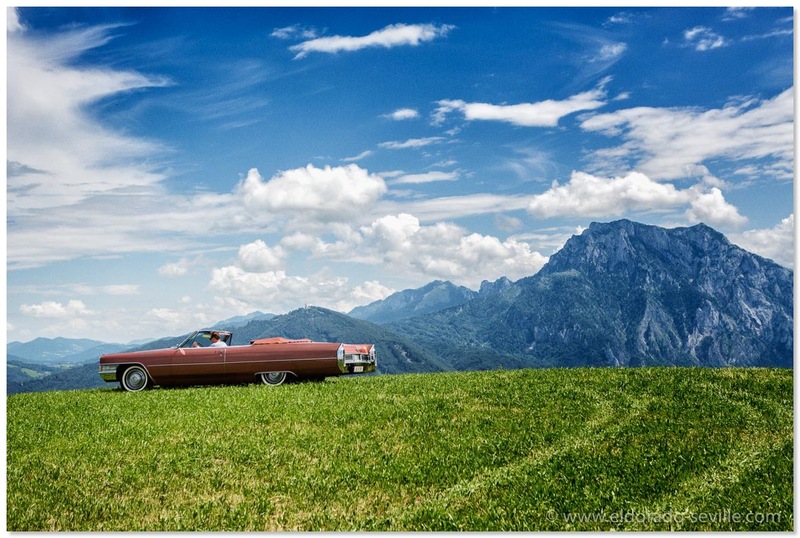 This has once again been impressively demonstrated at the annual Cadillac Big Meet in Kremsmünster, Austria. 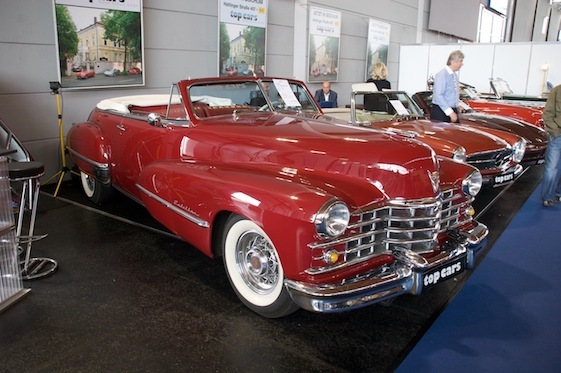 86 Cadillacs from the nineteen forties to the present day have been put on show and many of them were awarded with prices from a distinguished international jury. 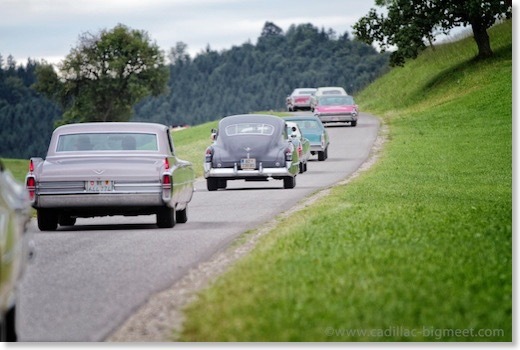 Even with this year’s number of cars below it’s record mark of 160 – due to the rather unfavorable weather situation – the Cadillac BIG Meet in Kremsmünster is still regarded as the largest annual Cadillac meeting in Europe. 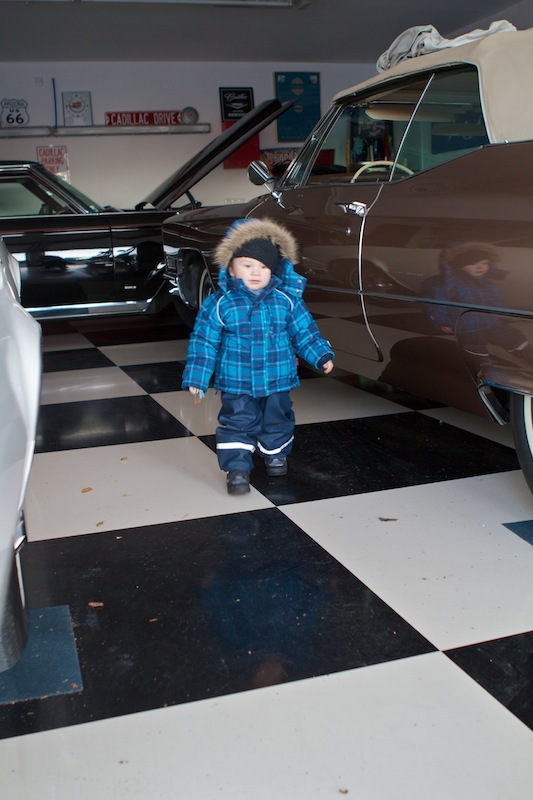 It is open to all Cadillac owners, regardless of age and history of the vehicle. 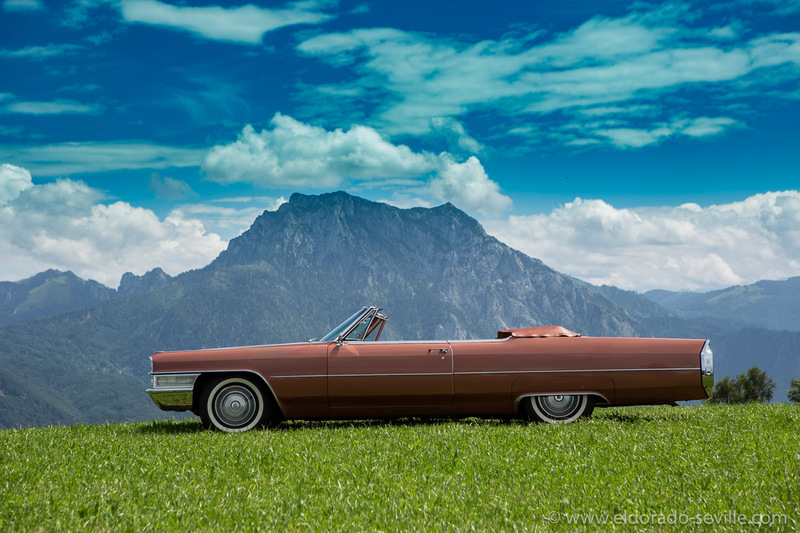 This year, the special focus was on cars from the nineteen seventies, represented by 20 cars from this decade, with the Eldorado convertibles clearly outnumbering other body styles. 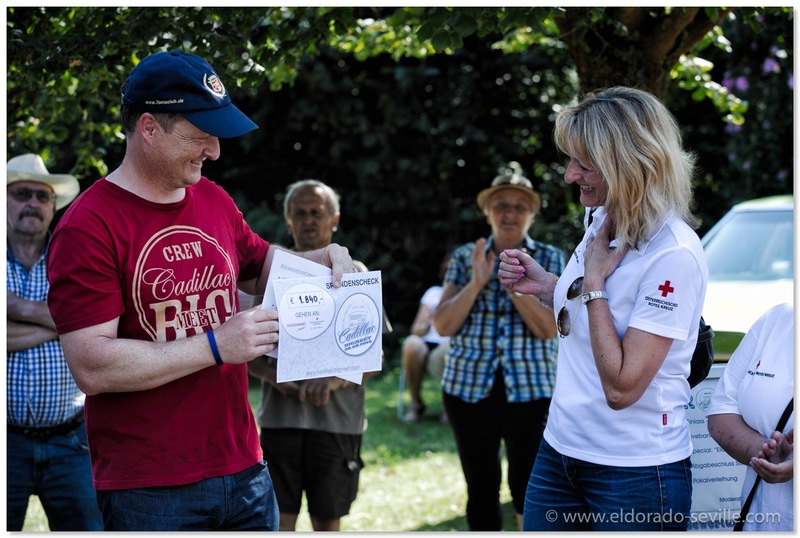 Organizer Georg Pfeiffer and moderator Ulla Theussl handed over the trophies in pouring rain this year – but the weather could not dampen the enthusiasm of the participants and the spectators. 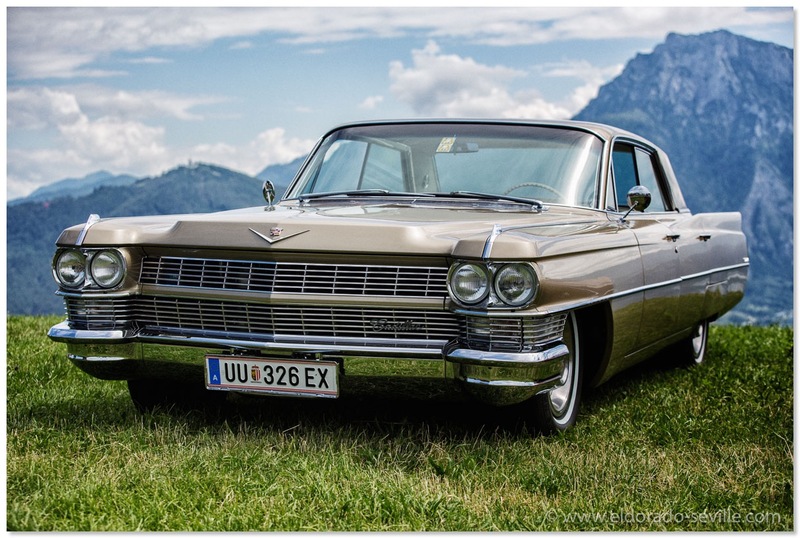 We took the 1967 DeVille this year. 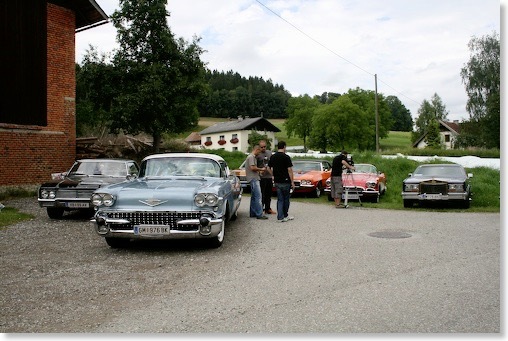 On the day before the meeting we held a driving tour for 40 registered Cadillacs. The participants were rewarded with breathtaking vistas along the whole route. 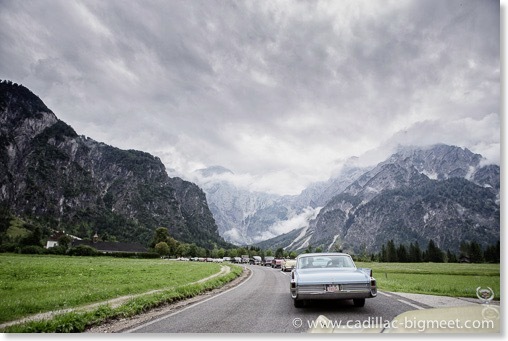 You can find a huge gallery of the pictures my wife and I shot from the driving tour and the show on the Cadillac BIG Meet website. 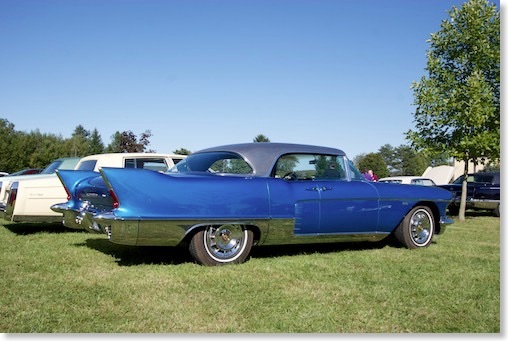 My personal favorite car at the show - the 1958 Eldorado Brougham! 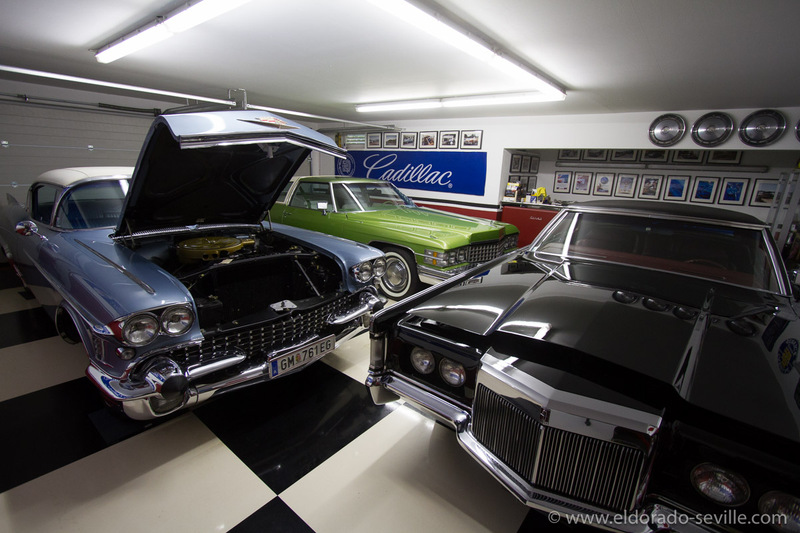 My friend Tayfun came to visit to prepare our Cadillacs for next weekends Cadillac BIG Meet in Kremsmünster. 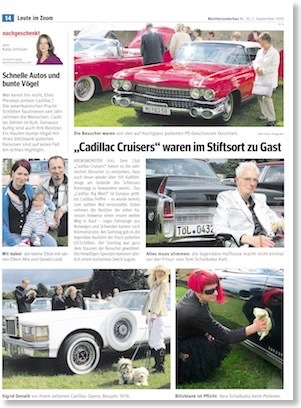 It´s the biggest and best Cadillac Meeting in Europe and I´m a proud member of the organization team. 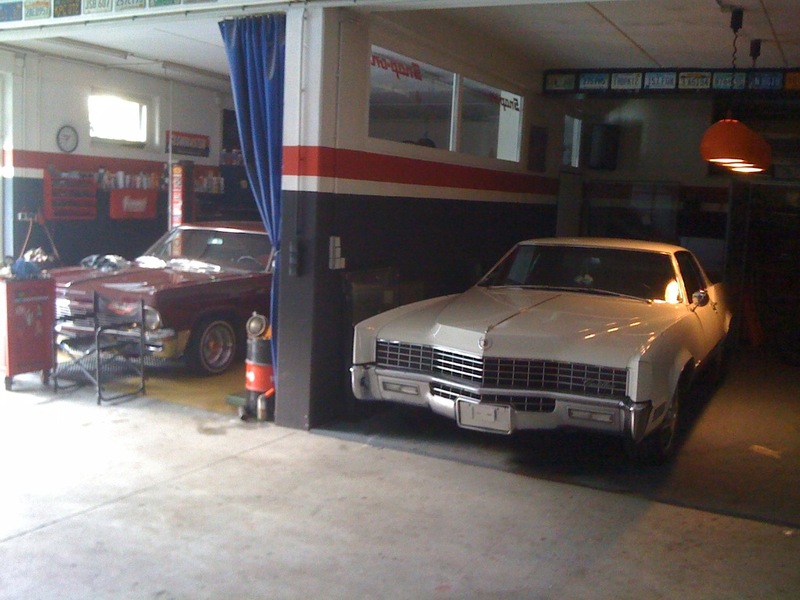 My friend and I will spend the rest of the week in the garage detailing our cars for the big show. 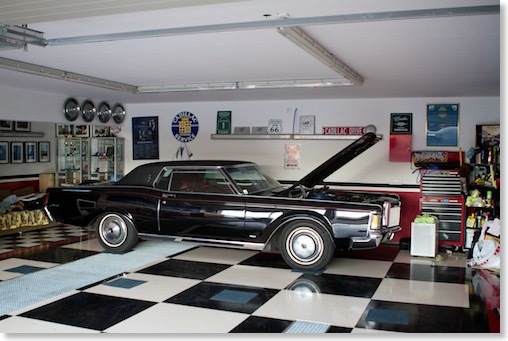 I usually take a week of from work a week before the Cadillac BIG Meet to have a good time in the garage. 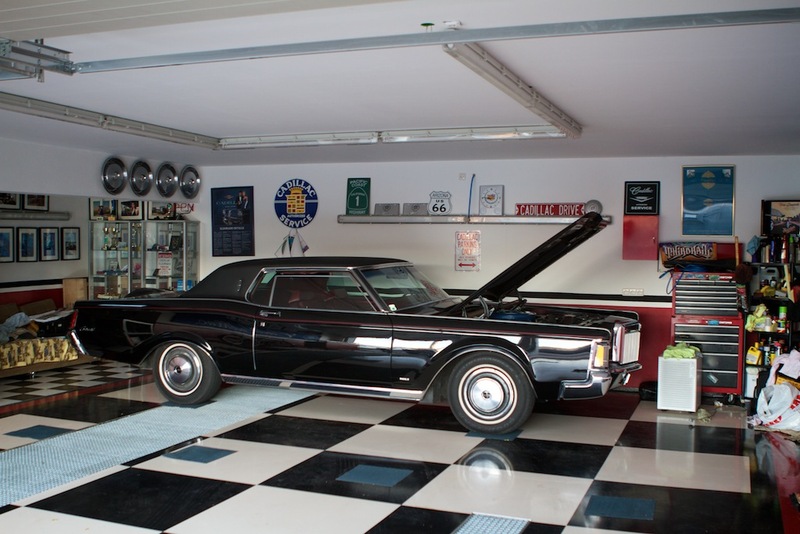 Tayfun is here with his newly acquired 1990 Brougham D`Elegance which needs some detailing and I will take my 67 DeVille to this years show. Both our cars will get full attention to the last detail. 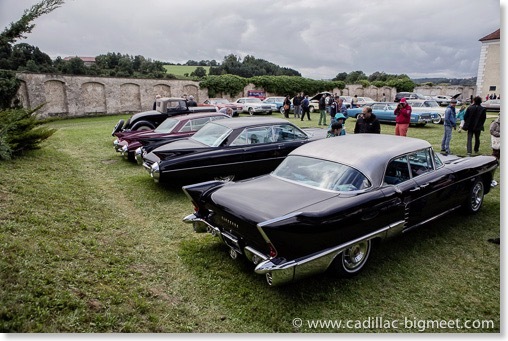 The Cadillac BIG Meet is Europe’s biggest Cadillac meeting - held every year at the last weekend of August. My wife and I are part of the organization team together with some good friends. 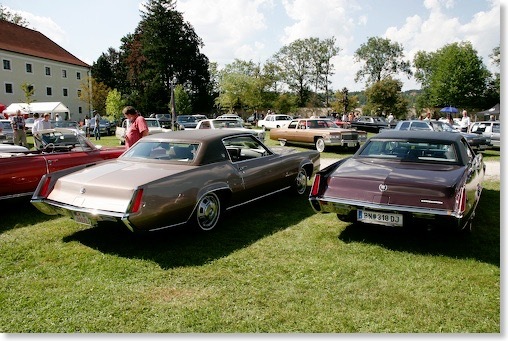 At this years addition we had the theme “Cadillac meets Lincoln“ and so we invited Lincolns to the show field. 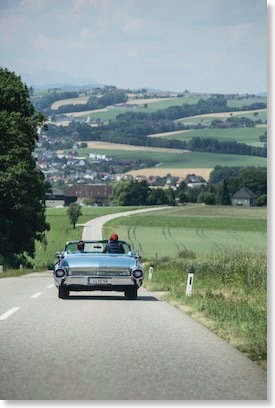 My own Continental Mark III just got ready for the show a couple of days before the show, so I drove it there along with my 1958 Eldorado Seville which was piloted by my friend Tayfun. 30 minutes before the tour started, suddenly the 58 cut out and did not want to start again. 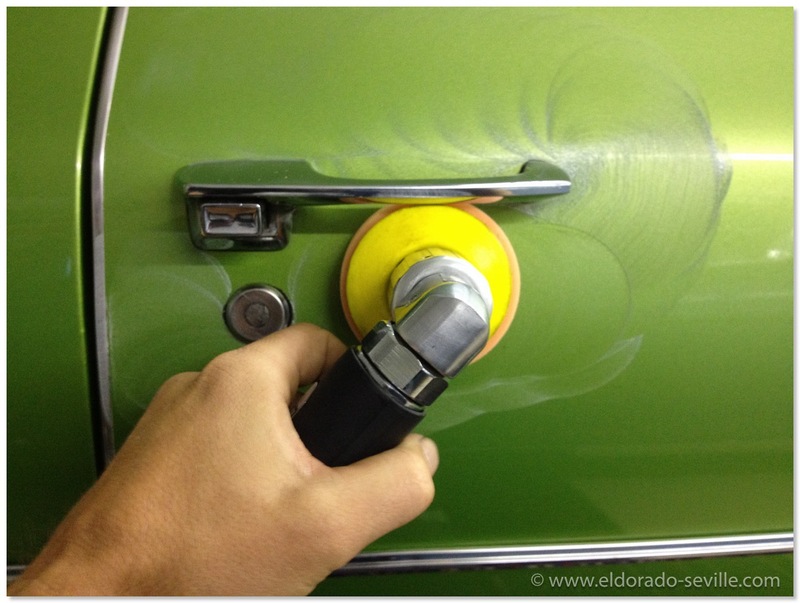 I once again suspected a clogged fuel line and we blew the line through. Unfortunately it did not help at all - the line was free. 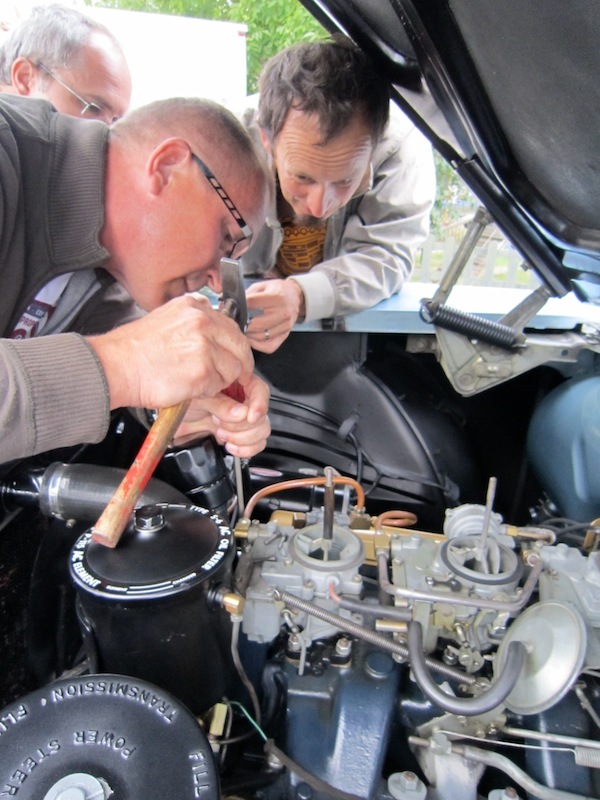 With the help of Lucky (a fellow 1958 Biarritz owner) we disassembled the fuel pump and found out that the valve inside came loose and was no longer in its seat. Lucky put it back and the car ran beautifully again. It all was fixed in 15 minutes and the 58 was ready for the cruising tour. 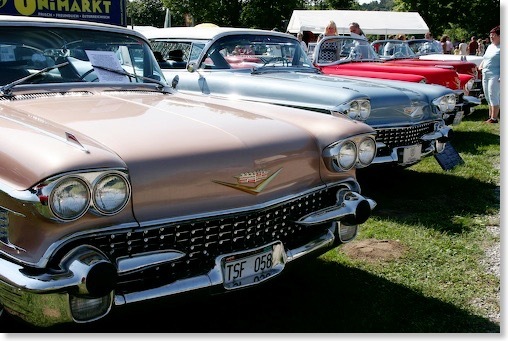 At the show on sunday 133 Cadillacs and 11 Lincolns participated. 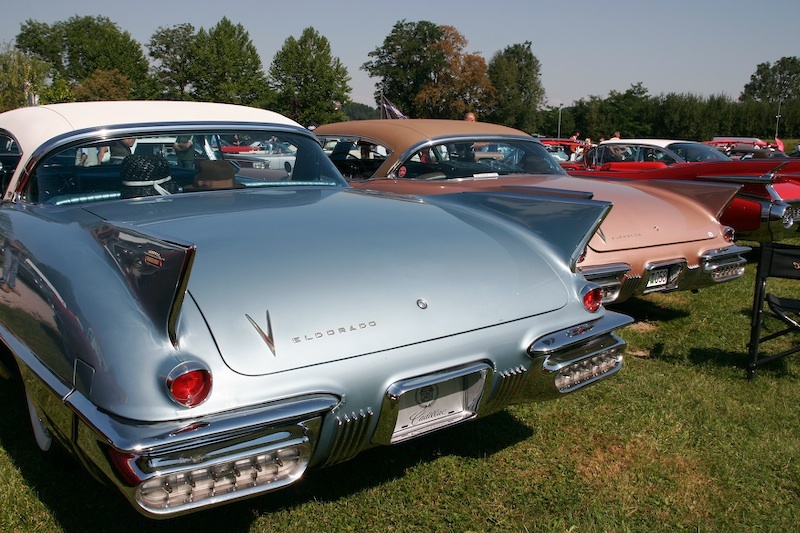 There were many awesome cars on the show field, like one of the worlds best 1953 Eldorados, a spectacular 1958 Eldorado Brougham, lots of 59 Eldorados and everything else ranging from 1921 to 2011. The show was once again spectacular. 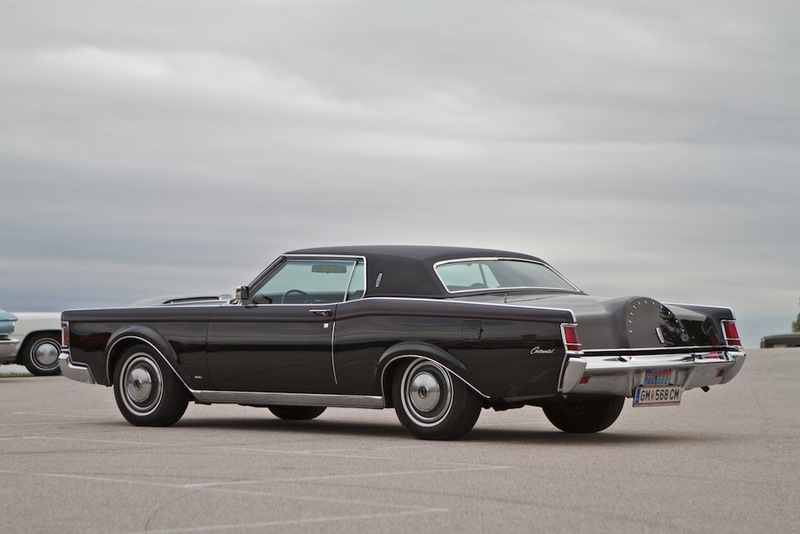 My 1971 Continental Mark III just before the start of the cruising tour. 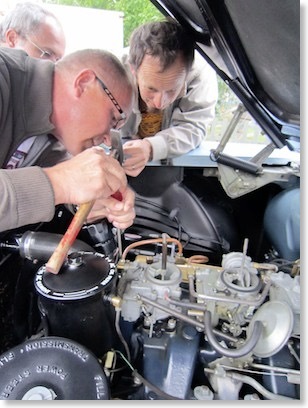 Lucky repaired the fuel pump of my 58 Seville 30 minutes before the start of the cruising tour - Thank you Lucky!!!! 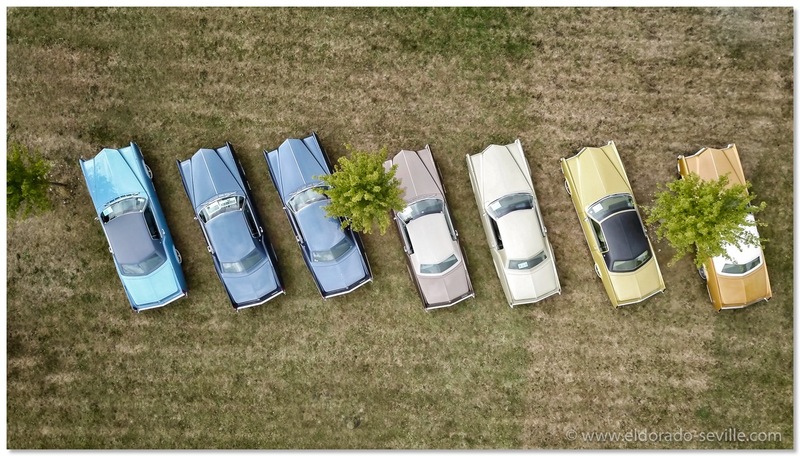 This years Cadillac BIG Meet had the special theme „Cadillac meets Lincoln“ and so I wanted to take my newly acquired Continental Mark III along with my 58 Cadillac Eldorado Seville to the show. As the car return from the technical inspection on Wednesday night I only had 2 short days to detail the car for the show. 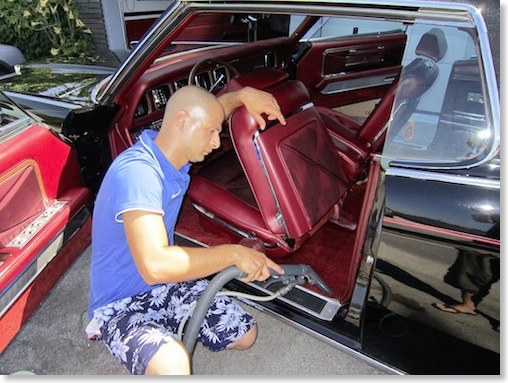 Luckily my buddy Tayfun volunteered to come to my garage for 2 full days to help me getting the car show worthy. 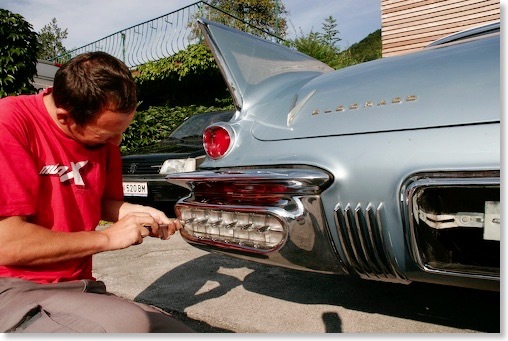 Without his help I would not have been able to get the car ready in time. Thanks Tayfun!!!! 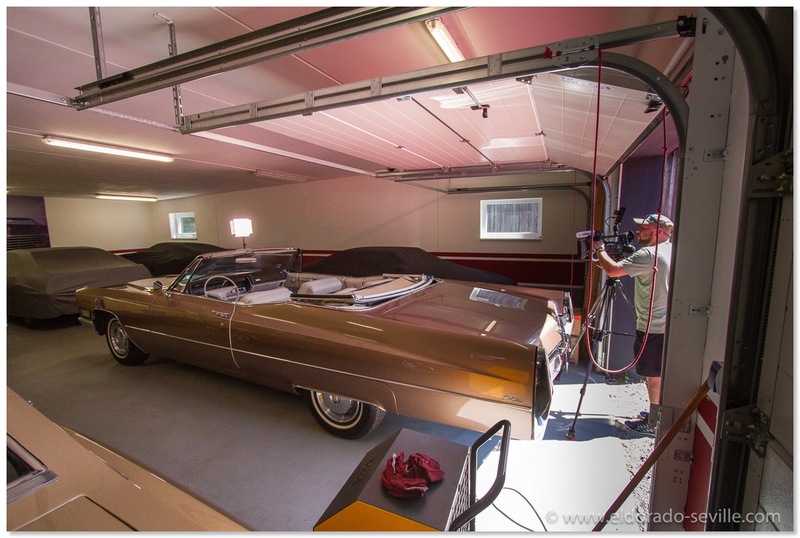 As I ran out of garage space my other great friend Richard helped me out and lets me store my 1967 Eldorado at his cool garage for a while - thanks Rick!! 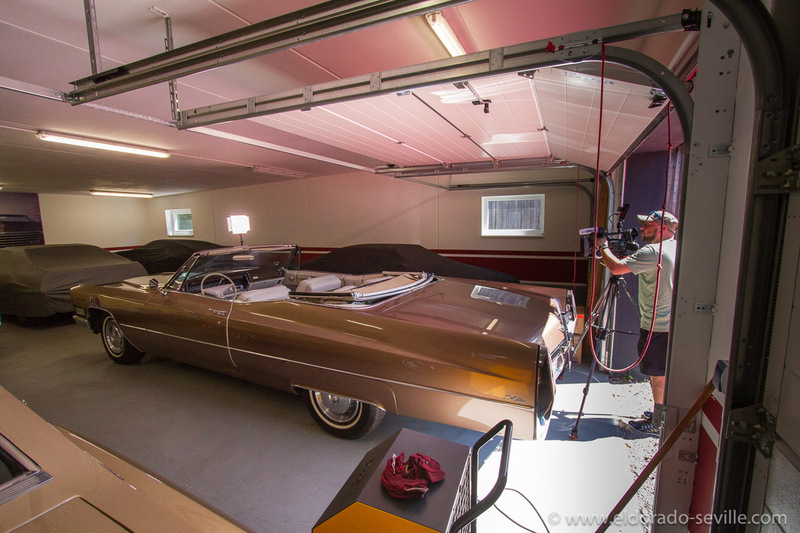 My 67 Eldorado is temporarily stored at my friend Richards garage until I find a solution for my storage problems - thanks Rick! 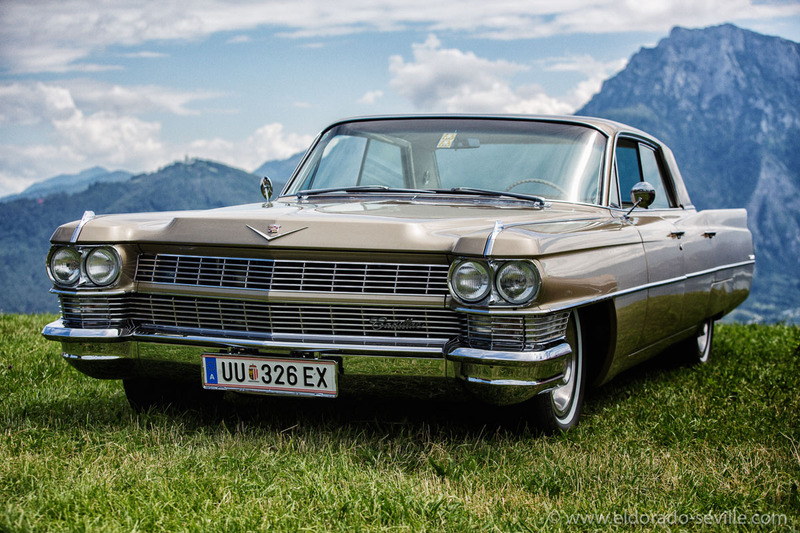 The Cadillac BIG Meet is Europes largest Cadillac Meeting and it is held each year at the last weekend of August in Kremsmünster, Austria. Its already the 8th edition and it's a great show for everybody. The date for 2011 is August the 28th 2011. 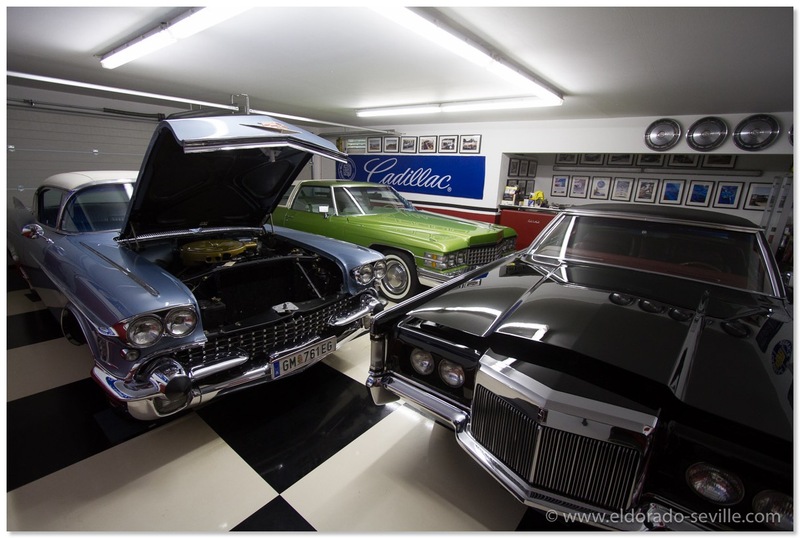 I´m part of the organization team together with my Cadillac friends. 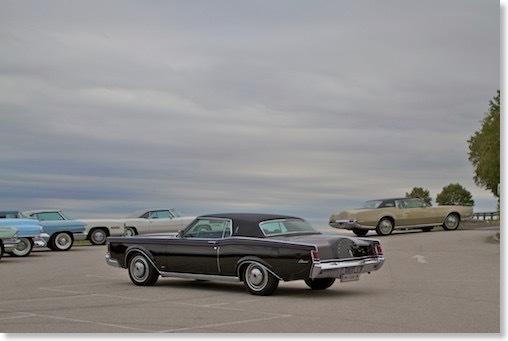 This year we would also like to invite Lincoln Owners to the Cadillac BIG Meet. 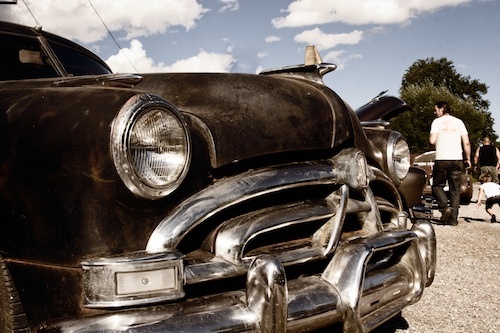 We would like to do a special presentation on the venue with these fine cars. 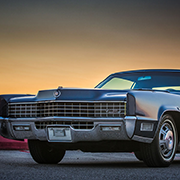 This years theme is “Cadillac Meets Lincoln“. 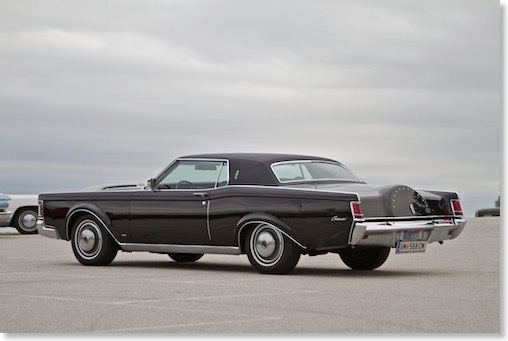 Of course we will hand out a special award to the most beautiful Lincoln as well. To be able to organize this special presentation we would like to welcome as many Lincoln Owners as possible. 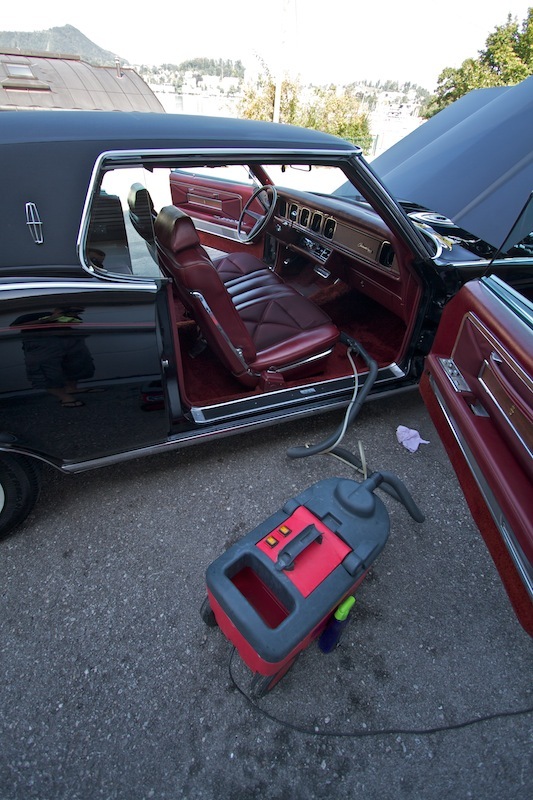 If you want to participate with your Lincoln, please let us know in advance - so that we can arrange things on the venue. Today my little family, together with our best friends, visited a nice small meeting which is held only 40 kilometers from our home. Its a small gathering of US-Car enthusiasts. 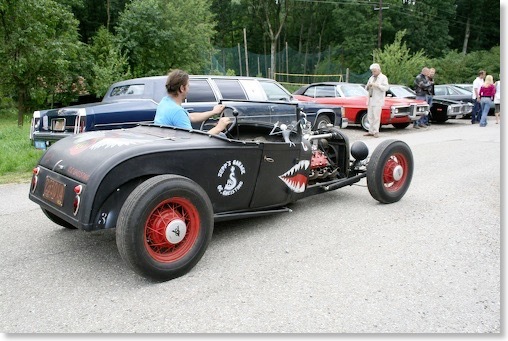 One of the organizers is collecting and building great Ratrods which he is always showing there. 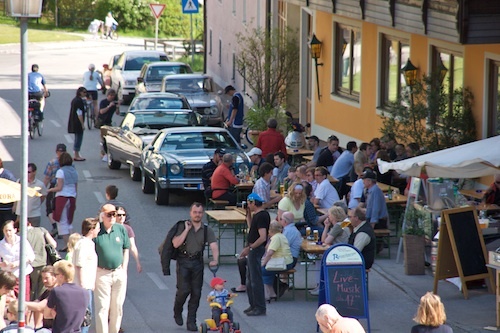 It's a very nice and relaxed atmosphere with nice cars and great people. Looking forward to the next edition. Sepp also gave us a tour through his fantastic garage and collection of super rare speed parts. This guy is unbelievable! 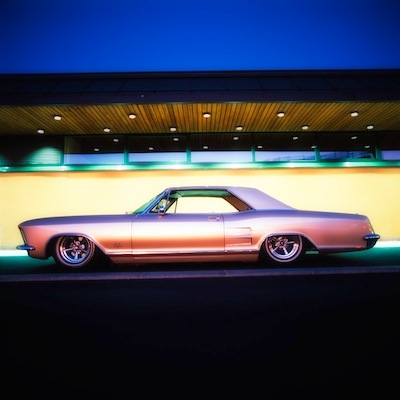 We took the 67 Eldorado to the show. My wife and I shot lots of great images which are available in this gallery. 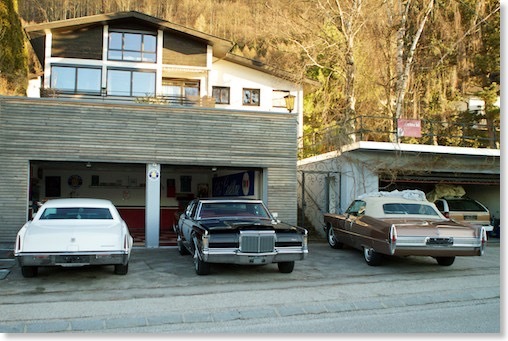 My family and I spent a weekend at Austrias biggest and best American Car Show in Dornbirn. 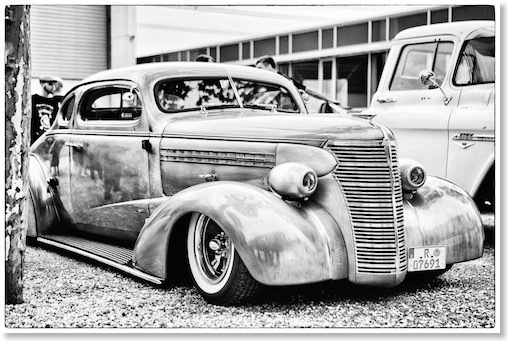 Over a thousand cars ranging from Classics, Antiques, Rat Rods, Hot Rods, Streetmachines, Customs and everything else took part in this show. We took hundreds of cool pictures which are available here! The show itself is a class of its own. We really had a great time there and are looking forward to the next edition of the show in 2013. 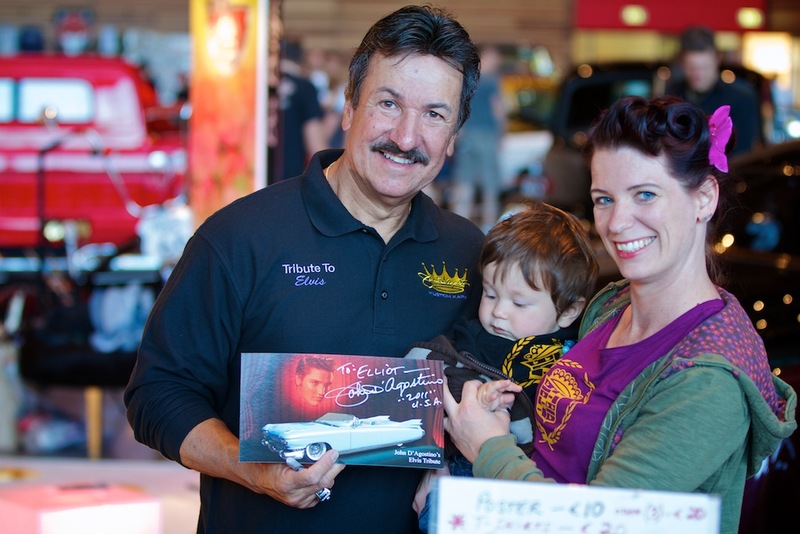 Mr. John D‘Agostino - the world famous customizer - signed autographs at the show, so I had to take a picture of him with my little son Elliot. Elliot was very exited and as it seemed he liked Mr. D’Agostino very much. 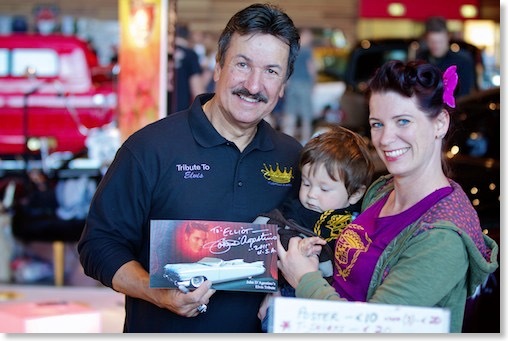 I guess he already is a big fan of his work ;-) The autographed card will get framed and displayed in Elliot’s room. 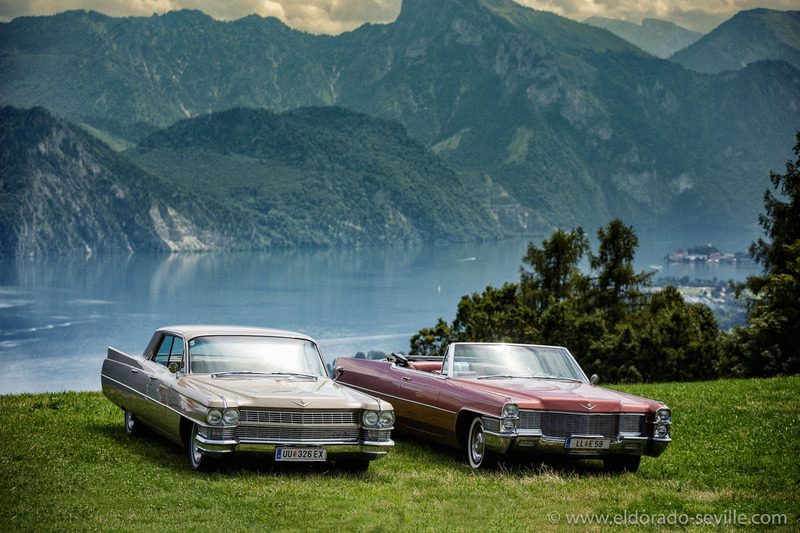 The “Klassikwelt Bodensee“ is a great classic car, boat, and plane fair. 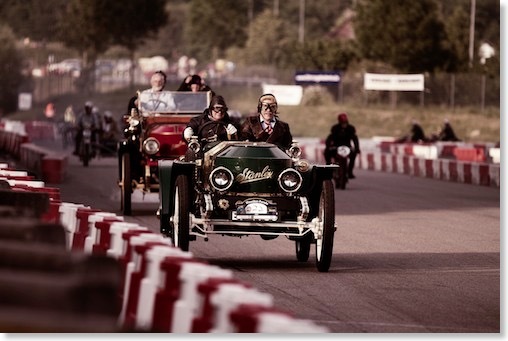 When was the last time you saw a Stanley steamer race while classic airplanes were doing an air-show above your head? 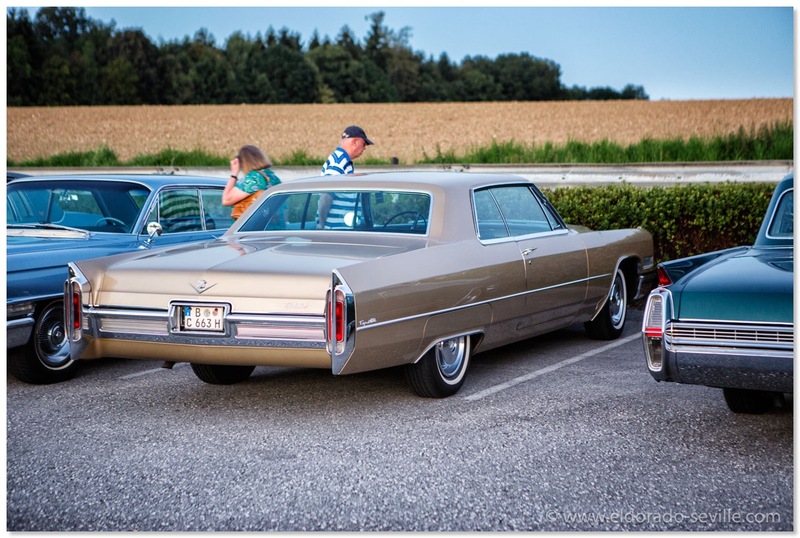 Only at the Klassikwelt Bodensee in Friedrichshafen / Germany! My wife Afra and I took lots of great pictures while we were there. Click on the picture below to go to the gallery! 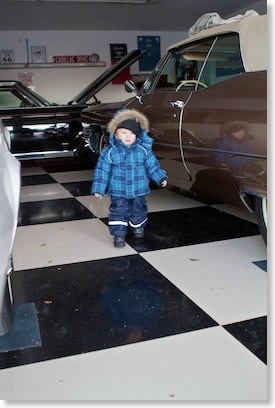 Despite the bad weather the Cadillac BIG Meet 2010 was a great event. 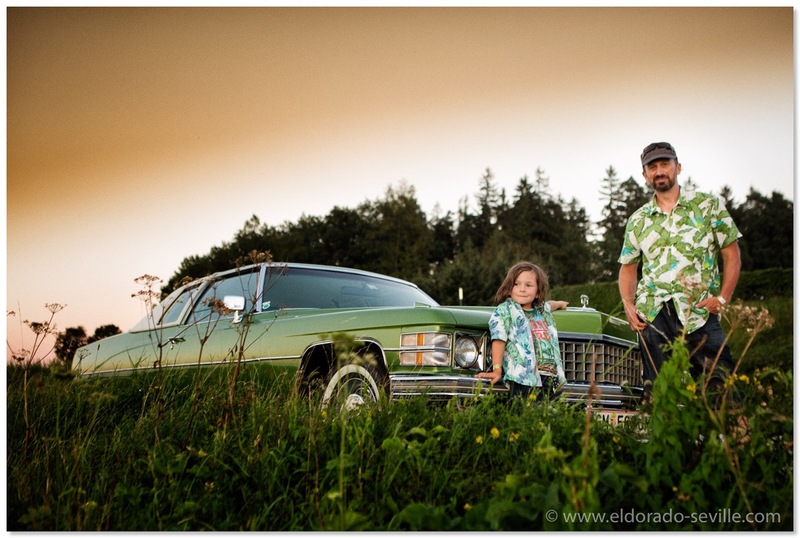 We took part with our 1967 DeVille this year as the theme was “The Cadillac Convertibles“. 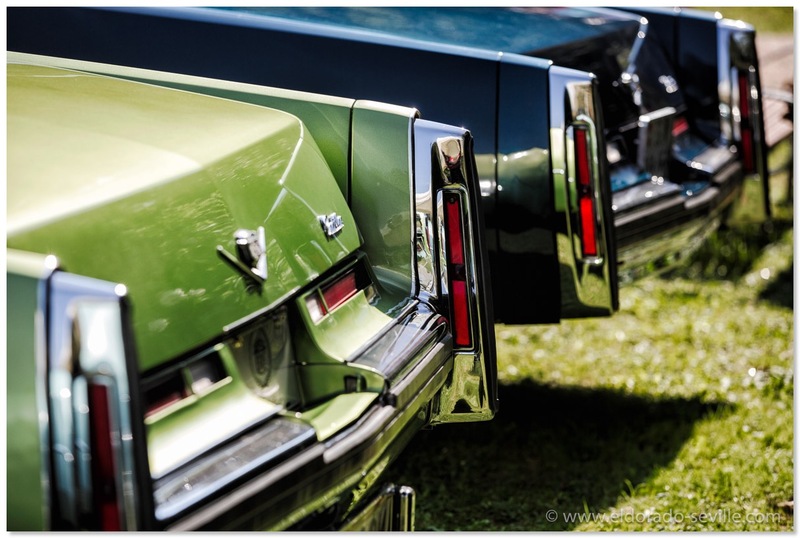 You can find a huge image gallery on the Cadillac BIG Meet website with hundred of pictures. Check it out! 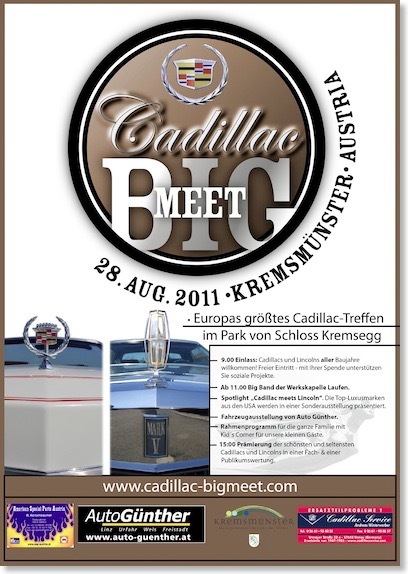 I´m already looking forward to the Cadillac BIG Meet 2011 on August 29th 2011. 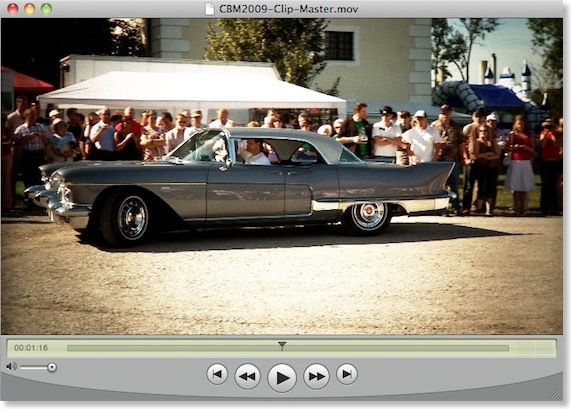 Today I finished a short video clip of the Cadillac BIG Meet 2009. 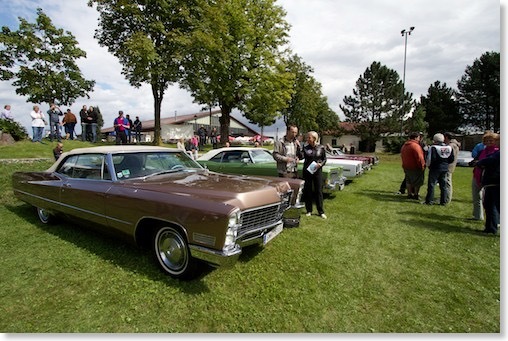 This is Europes largest and best Cadillac Meeting held every year at the last weekend of August. The next one will be held on August 29th 2010. More info about the meeting can be found here. 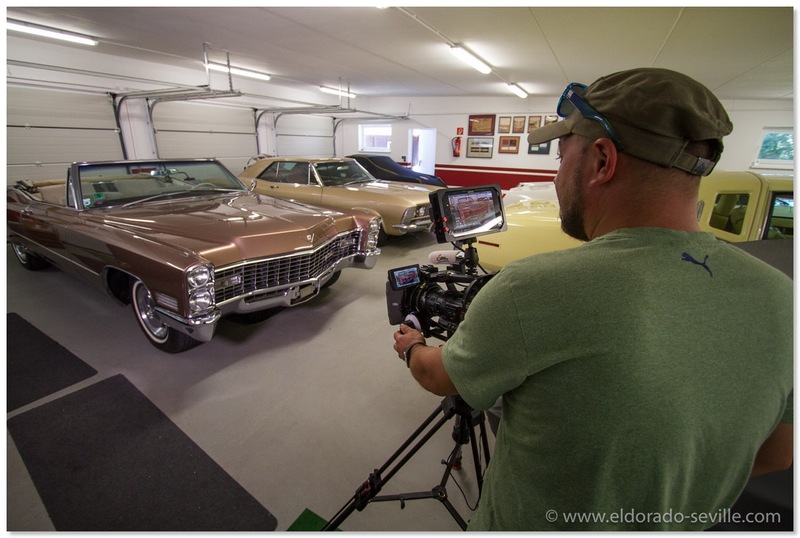 I did some filming at the 2009 event and posted the video in the video section of the Cadillac BIG Meet. Enjoy this nice short clip with some fantastic cars. 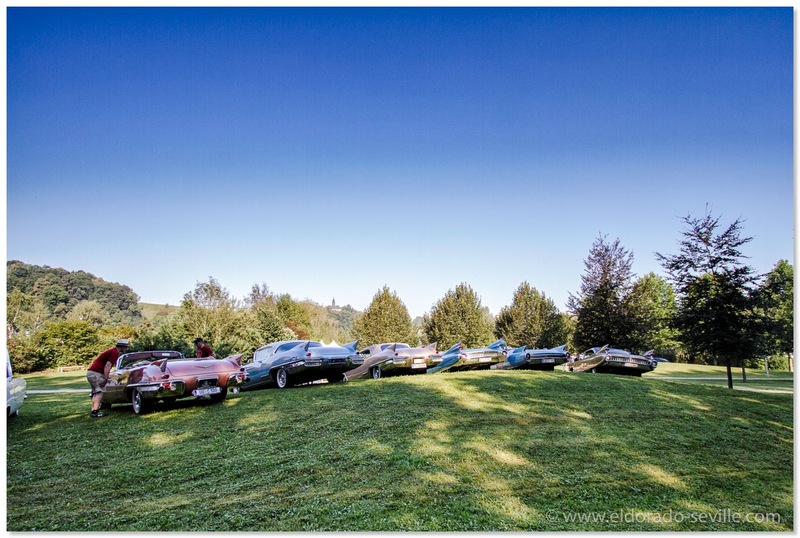 The Cadillac BIG Meet was a huge success! 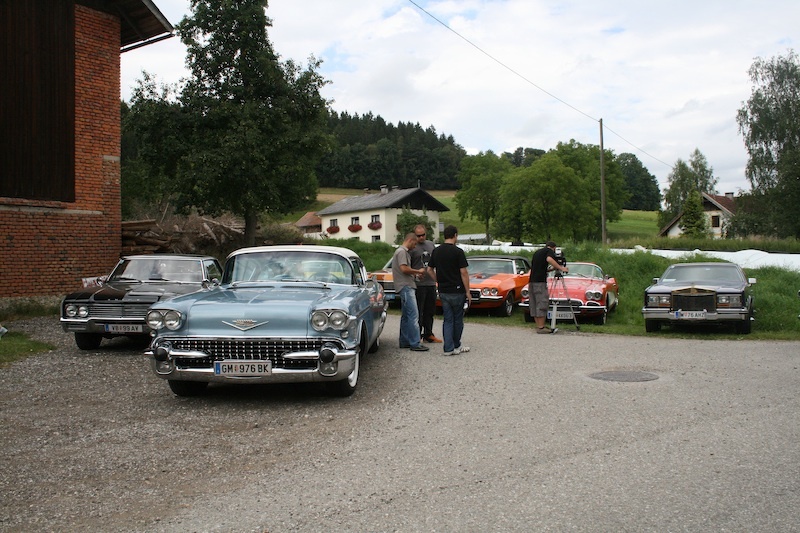 I just returned from the Cadillac BIG Meet - Europes largest Cadillac Meeting where I am in the organization team together with some friends. Its held in Austria every last weekend in August. This year we had the sixth edition. 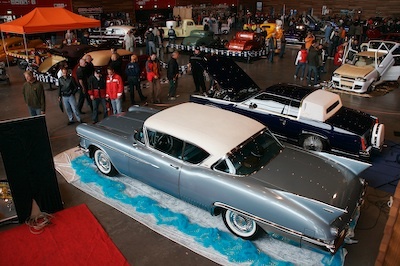 Thanks to all participants - the 2009 Cadillac BIG Meet was a huge success once again! 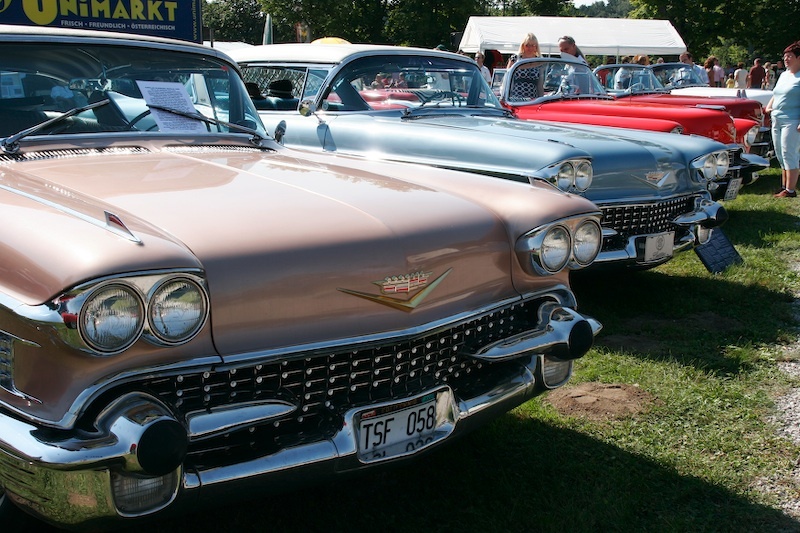 140 Cadillacs made it to the show this year. 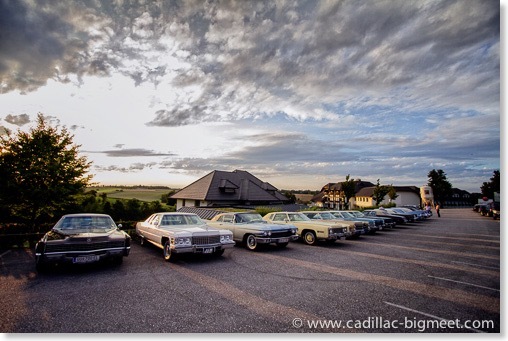 As we celebrated the 59 Cadillacs 50th birthday, we managed to get 17 of them parked side by side. 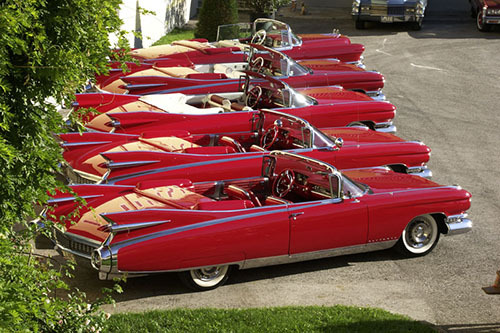 9 of them were Eldorados, ranging from 6 Biarritzes and 2 Sevilles to the super rare Eldorado Brougham of 1959. 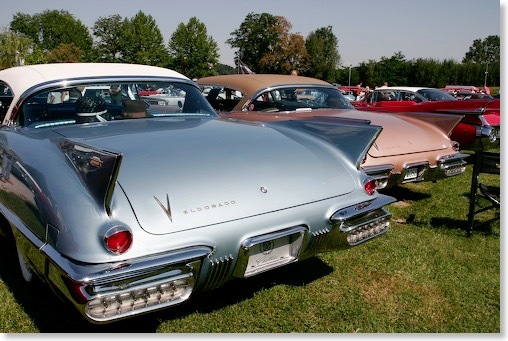 Some of the other highlights among all these beautiful Cadillacs which made it to the meeting- were a perfect 57 Eldorado Brougham and 2 1953 Eldorados and many other awesome Cadillacs. 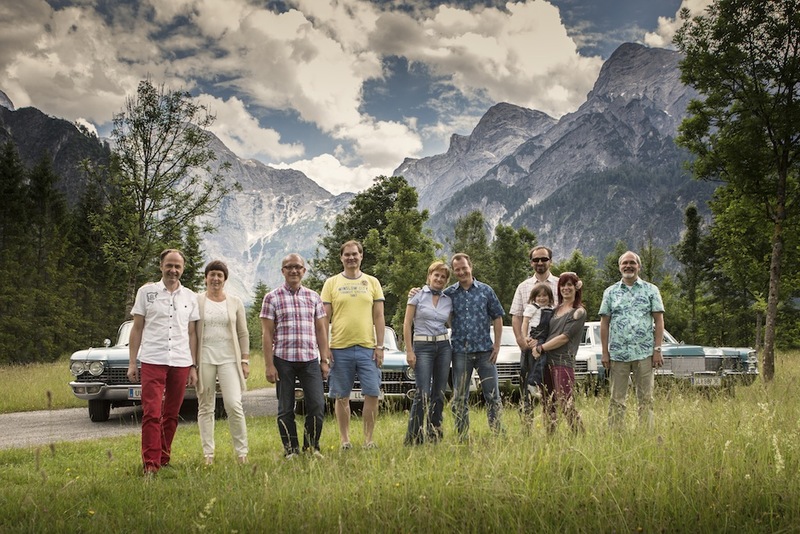 Visitors came from Austria, Germany, Czech Republic, Hungary, Belgium, Sweden, Switzerland and Norway. While the driving tour on saturday, which was limited to 40 cars, had some terribly rainy weather, Sunday, the day of the show was just splendid. I took my 1958 Seville to the show. But look for yourself and check the image galleries with more than 800 pictures my wife made this year. 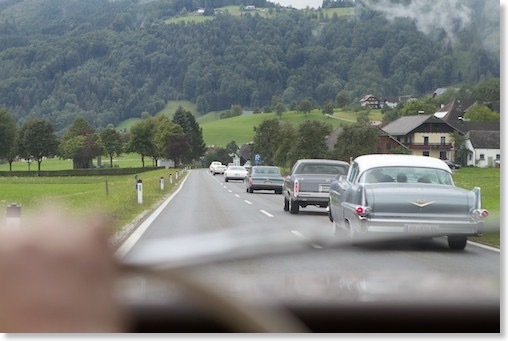 on the picture above you can see the venue - in the front there is my all-time favorite car - the 1957 Eldorado Brougham. This one was in perfect condition. 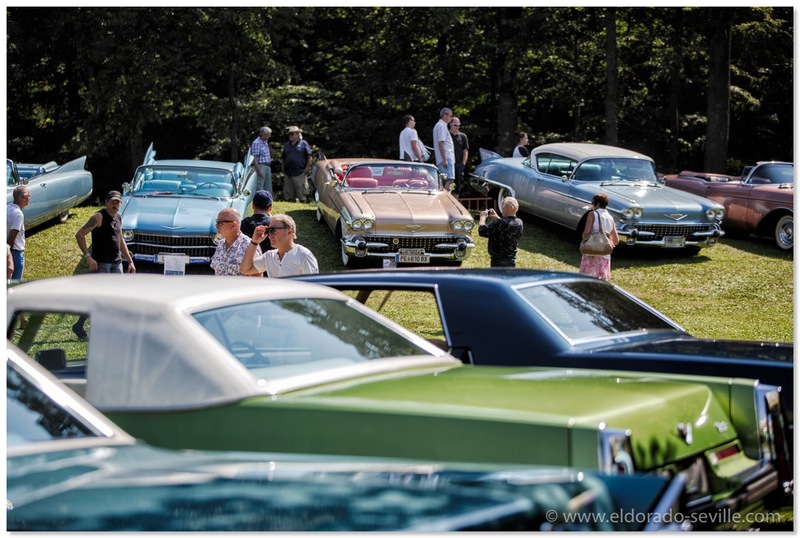 The Cadillac BIG Meet - This Weekend! 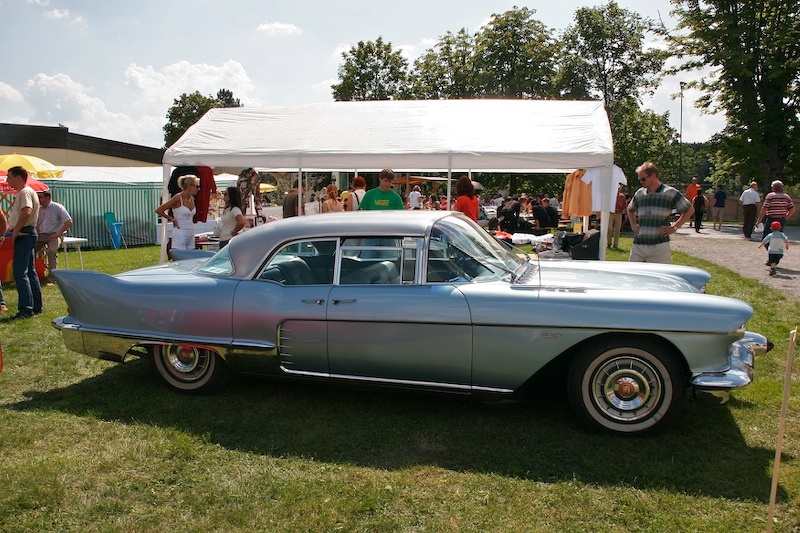 The Cadillac BIG Meet 2009 will happen this weekend - August 30th. 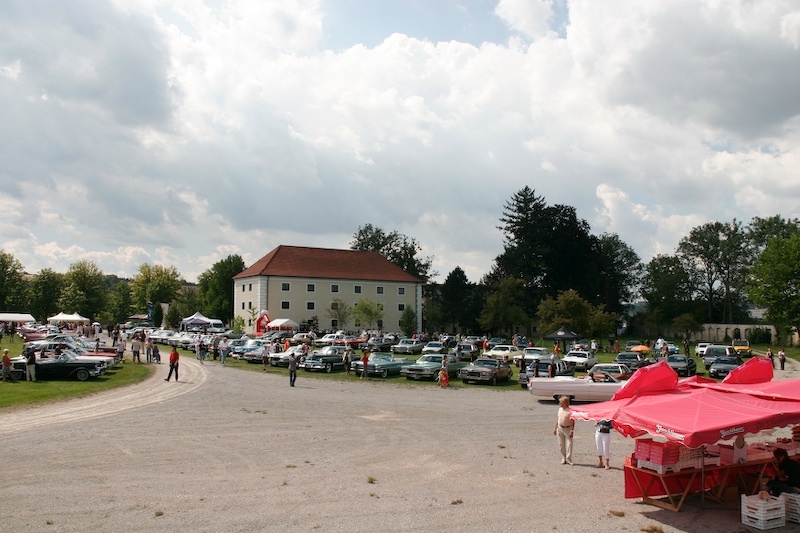 Its held for the 6th time this year at the Kremsegg Castle in Kremsmünster in Austria. 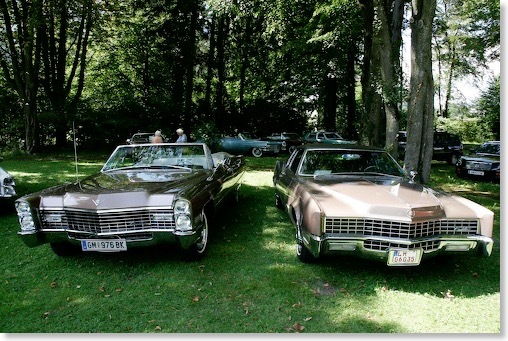 This is the biggest Cadillac Meeting held in Europe and about 150 Cadillacs are expected. For more info click on the image below - which was taken at the show. 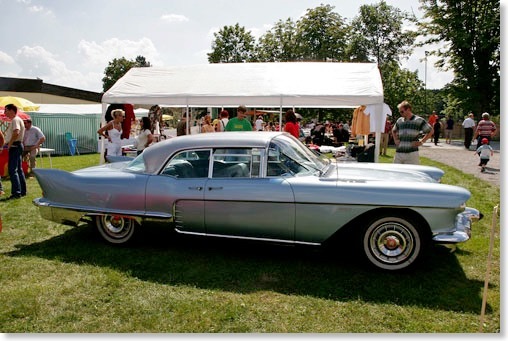 This years theme is “The Cadillac Fin” and the 50th birthday of the 1959 Cadillacs. 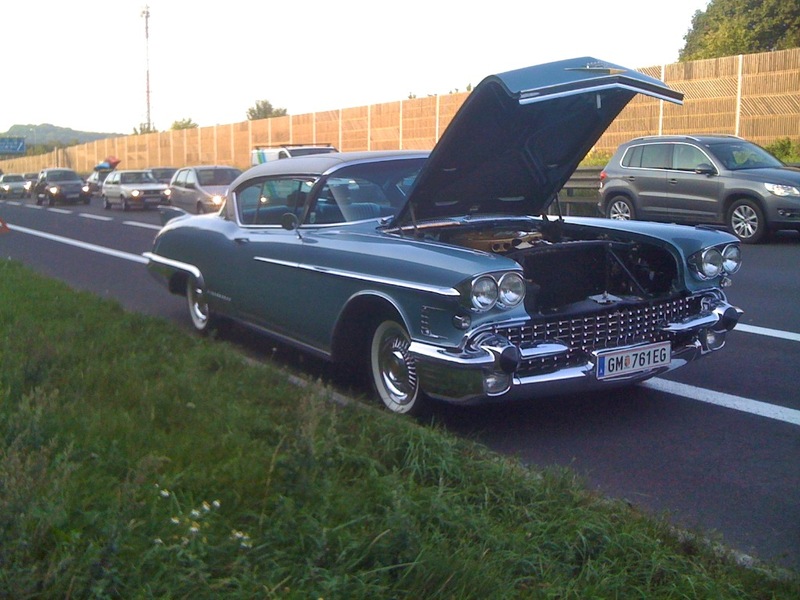 I will take my 1958 Eldorado Seville to the show, as it is the only Cadillac I own which has fins. 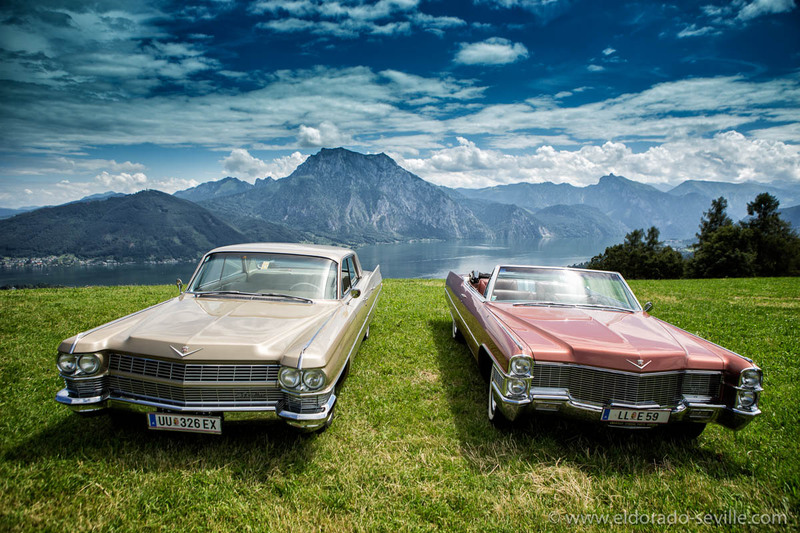 The US-CAR-SHOW in Dornbirn is held every second year and is Austrias finest car show. 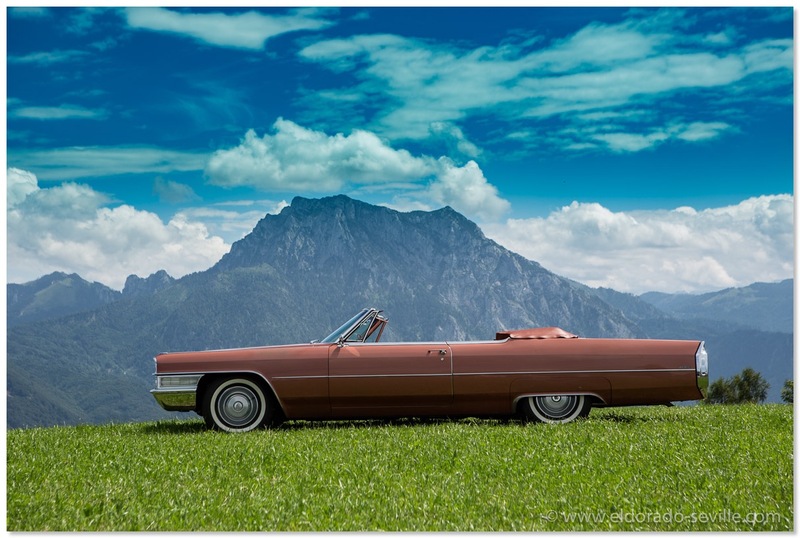 I always exhibited one of my Cadillacs at the indoor show in the past years, but this year I decided to take the Roadmaster for the trip and just take part as a regular visitor. The show itself is a class of its own. 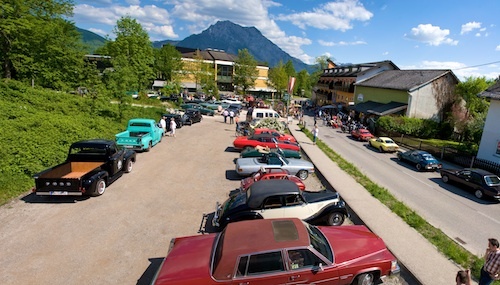 You can find hundreds of Hotrods, Classics and Muscle Cars there which you do not see at any other shows in Austria. 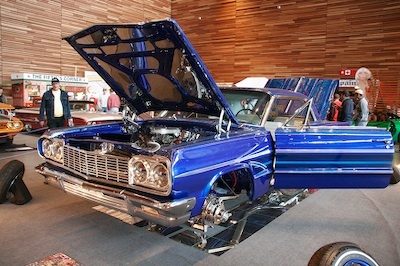 We really had a great time there and are looking forward to the next edition of the show in 2011. I shot 2 hours of footage at the 2 days of the show, which my wife Afra and I edited down to a 11 minute film, which is now available. 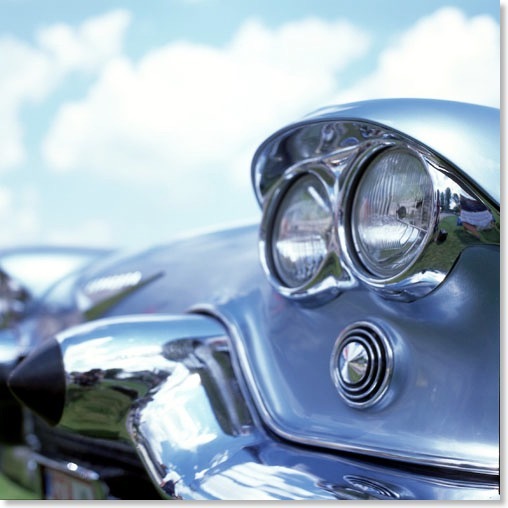 It features some great Cadillacs like a 53 Eldorado, 57 Biarritz or a 1959 Biarritz and many other great cars. We met with some friends and drove there in a 7 car convoy. It took us a 7 hours to get there as we also stopped at a very cool diner along the route. You can find a huge selection of pictures of this trip in the image gallery. Most pictures were taken by my wife Afra as I did the filming part this time. 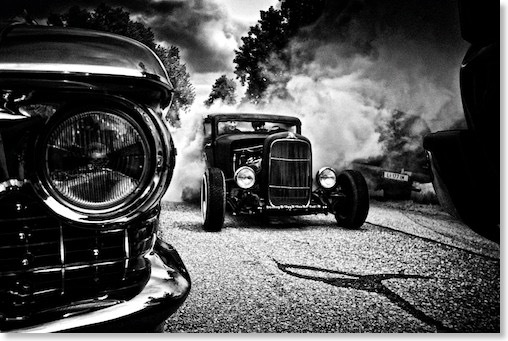 The black and white one were shot on real "old fashioned" analog film with a medium format camera. Afra also shot two roll of slides which were scanned after development. Enjoy! A very cool High Definition film will follow in a couple of weeks. So stay tuned. 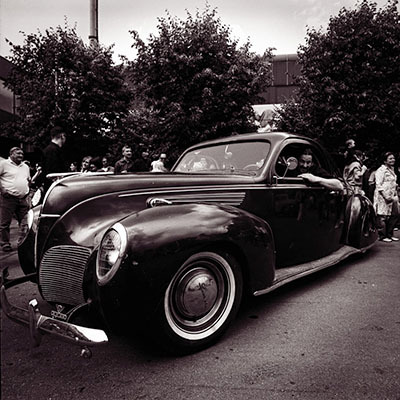 Sepps Lincoln Zephyr - Aweseome and rare car. Click on the images to go to the gallery for more images like this. Cadillac BIG Meet 2008 - A great show! 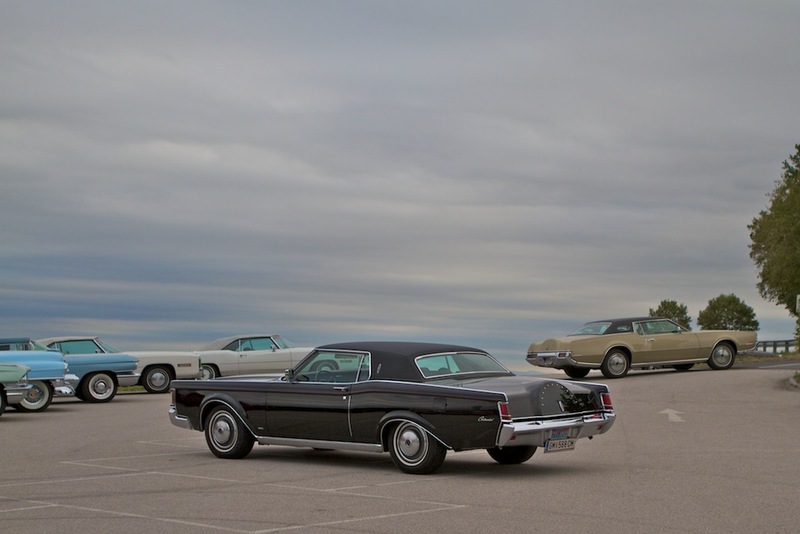 The Cadillac BIG Meet took place for the 5th time this year. 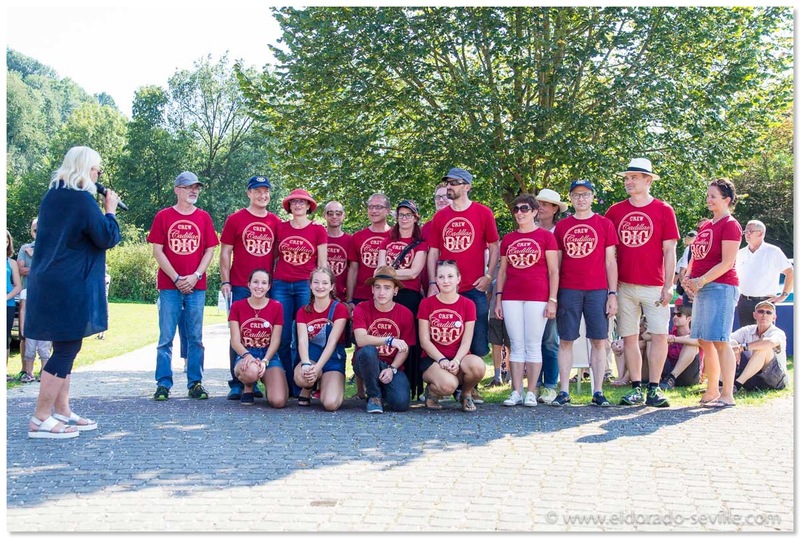 I´m part of the organization team. 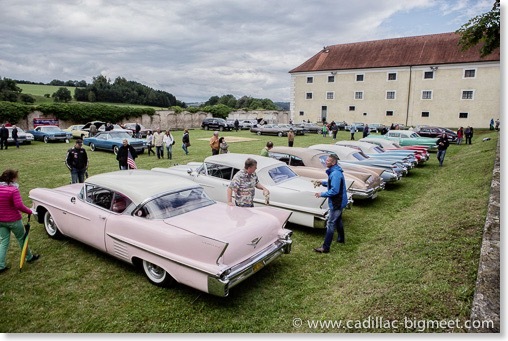 At this years event 115 Cadillacs from all over Europe attended. Everybody had a great time and it was a huge success once again. 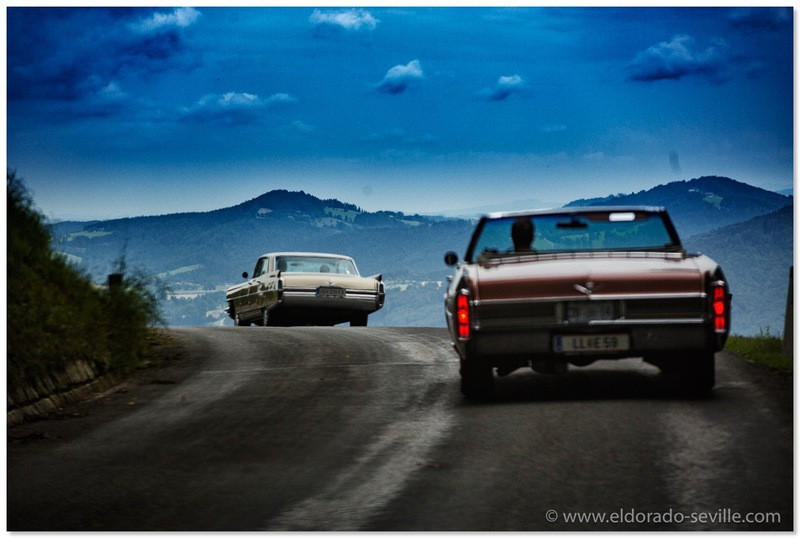 Watch out for next years Cadillac BIG Meet which will be held on August, 30th 2009. You can see hundreds of pictures of this years event by clicking on the picture below! 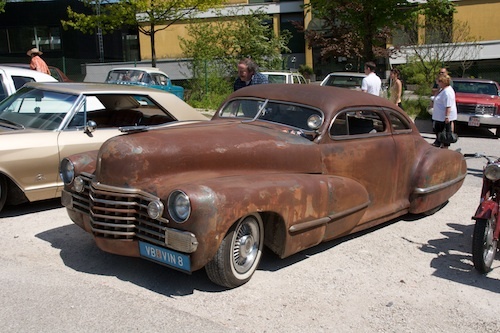 The new video of the last „Mostkost Kustom Meet“ which was held 2 weeks ago - is now online. You can watch the high quality Quicktime movie by clicking on the image below. I´ve also added some new images to the photo gallery. 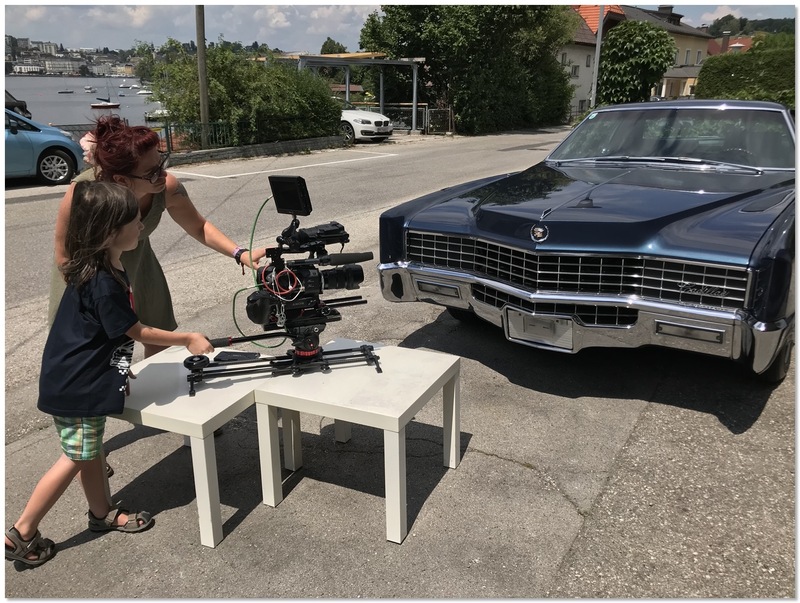 Today the national Austrian TV station ORF shot a short event promotion report for the upcoming Cadillac BIG Meet on August 24th. 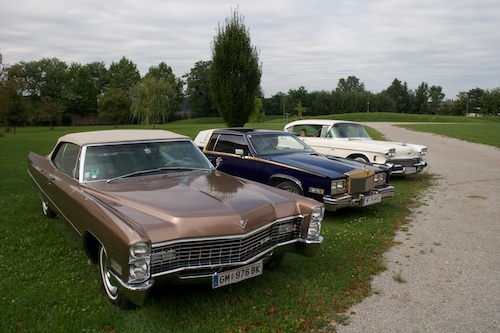 We had some nice cars on the venue like a 57 and 59 Biarritz, a 76 Bicentenial, a 81 Biarritz Custom, a 58 Sedan, and my 67 Deville. The report will be aired on August 21st on ORF2 at 7 PM. Below are some impressions of the shooting. 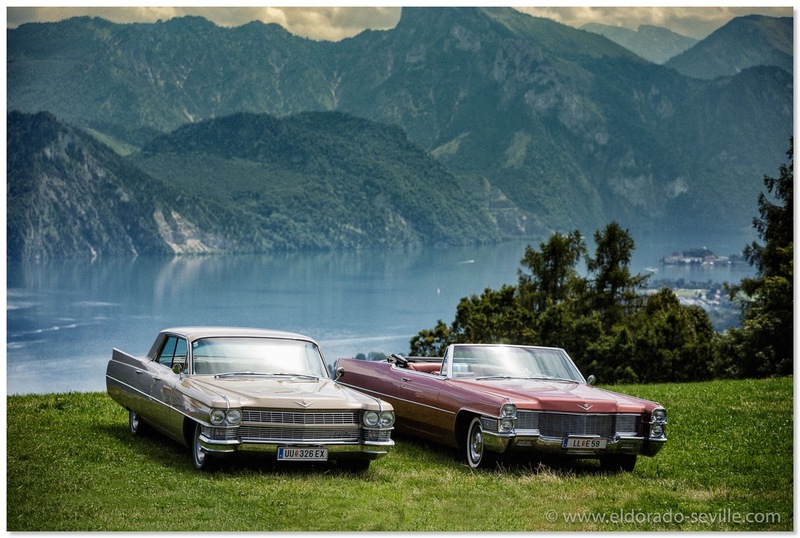 My wife and I visited the "Klassikwelt Bodensee" in may during our holiday. It was held in Friedrichshafen in Germany. 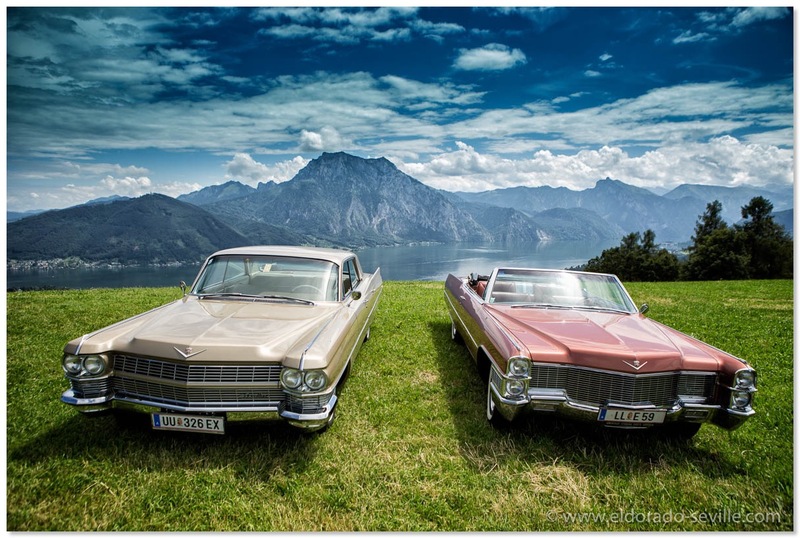 The „Klassikwelt Bodensee“ is a very spectacular classic car exhibition with hundreds of high profile cars on display and for sale. You can find a picture gallery by clicking on the image below. 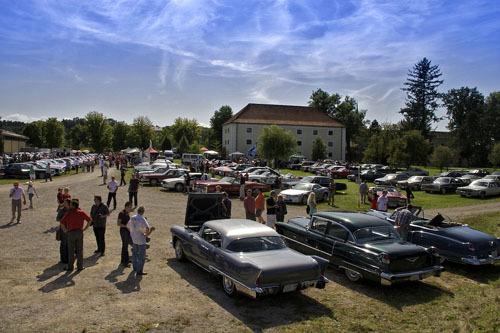 Today a small, but very nice car show for US-Cars and other classic cars and bikes was held in Altmünster at a museum. As this is located only 10 minutes from home, I drove both Cadillacs to the show. Below is a little preview. 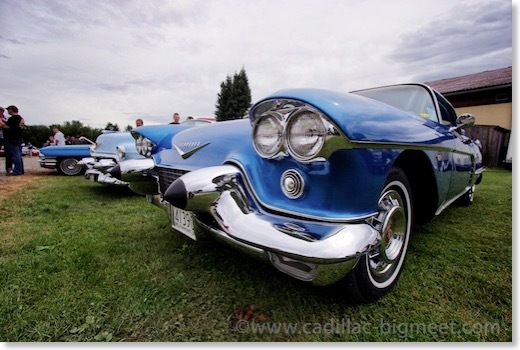 You can find hundreds of pictures from this years Cadillac BIG Meet on the website of the Cadillac BIG Meet directly. My wife Afra shot 2 rolls of slide film with her medium format camera. She has now scanned the slides and I´ve put them on my website. You can check them out if you click on the image below. 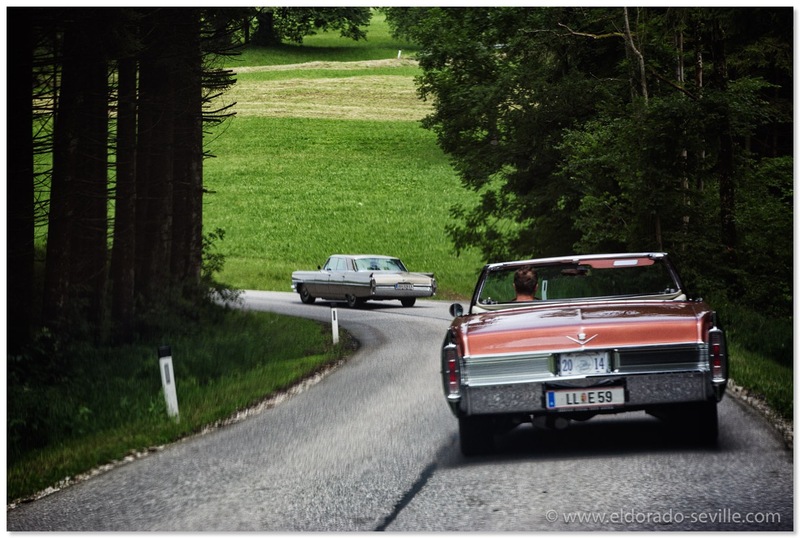 Last sunday the Cadillac BIG Meet was held in Kremsmünster/Austria for the 4th time. 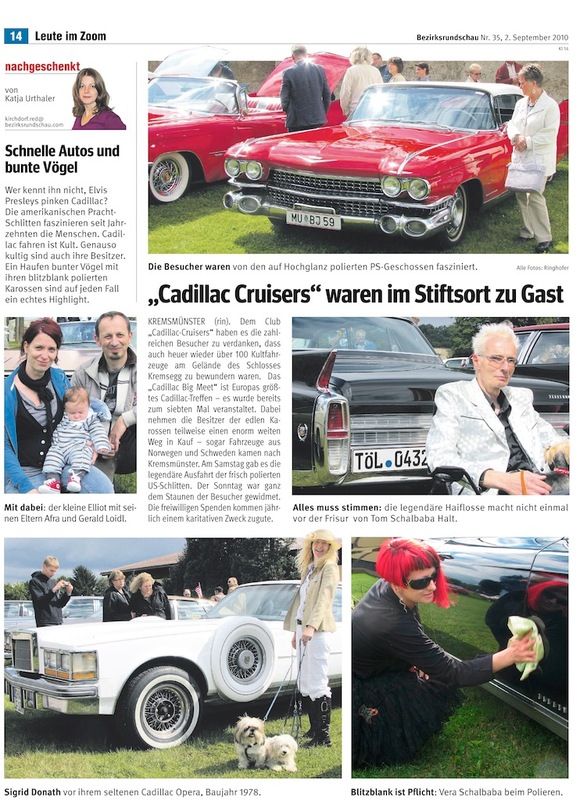 Cadillacs from 7 nations attended. I´m a member of the organization team. Over the last years it became a still growing meeting. This year really was the best of them all. 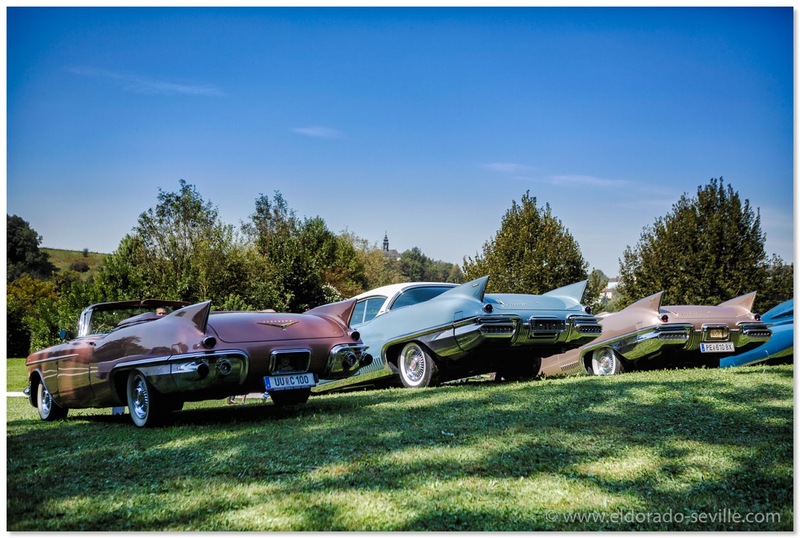 Weather was perfect and the show had the theme "The Cadillac Eldorado" and more than 35 Eldorados showed up - among them Eldorados from 1954 to 2002. 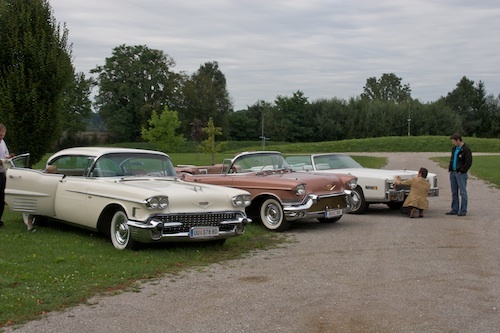 We had one 54, 3 56 Biarritz, one 56 Seville, a 57 Biarritz, a 57 Eldorado Brougham (another one unfortunately broke down on the way to the show), 2 1958 Eldorado Sevilles (one coming all the way from Sweden!! 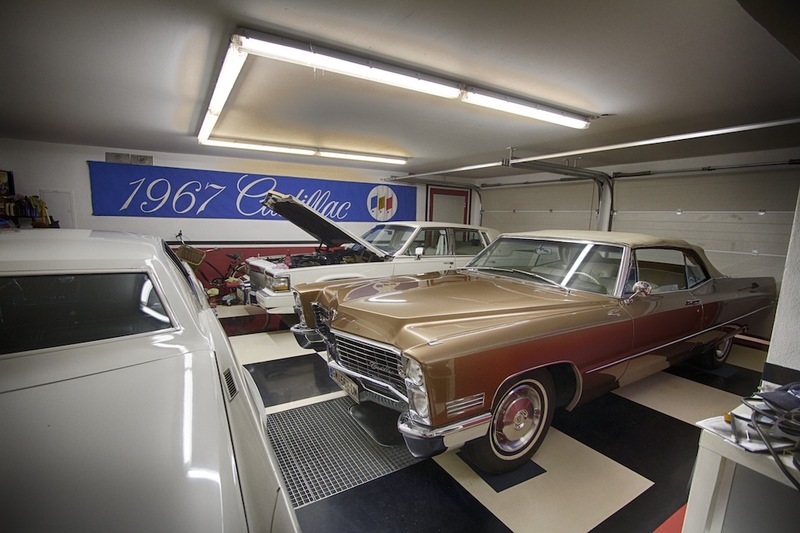 - the other being mine), 2 59 Biarritz, 1 59 Seville, (a 59 Brougham was also planned, but restoration was not finished on time), a 63 and 64 Eldo, 2 67s (one of them with only 30k miles), 1 68 (with 20k miles), a 71, 72, 73, 74, 75, 76 + a low mileage 76 Bicentenial, 79, 80, 81, 86, and lots of other Eldorados I forgot, but which you can see on the pictures. 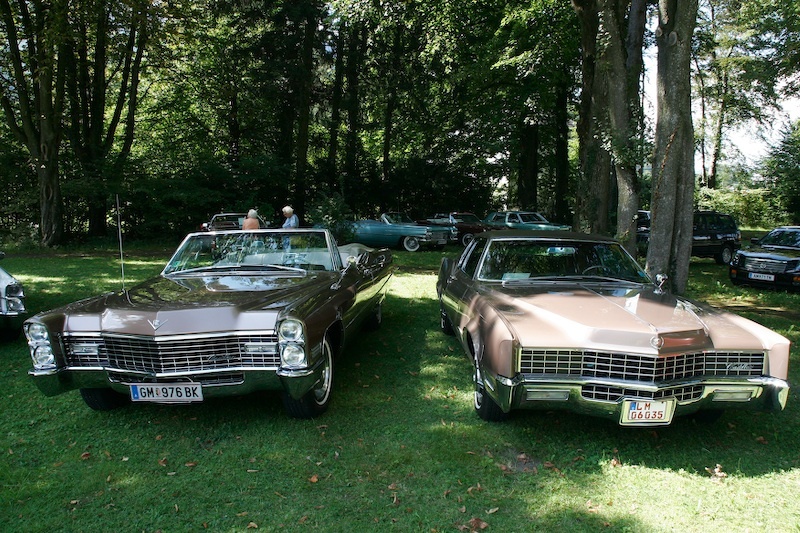 Altogether 113 Cadillacs showed up in the park of the Kremsegg castle during the show - and about 10 more after the show was already finished... The oldest one was from 1921. The mood was excellent and everybody loved it very much. 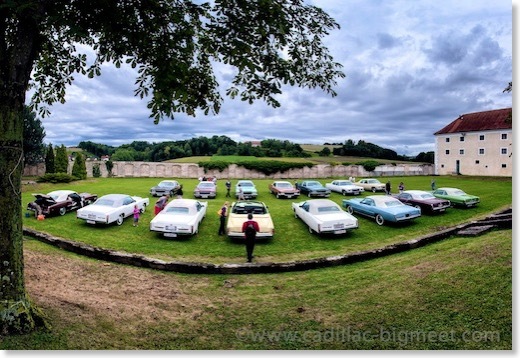 The last weekend probably was the best Cadillac related weekend I ever had, and you should not miss next years edition of the Cadillac BIG Meet. 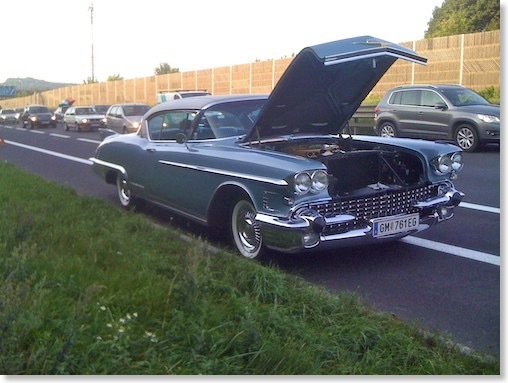 I´m on vacation this week and I´m using my time to prepare my Cadillac for the Cadillac BIG Meet which is coming up this weekend. 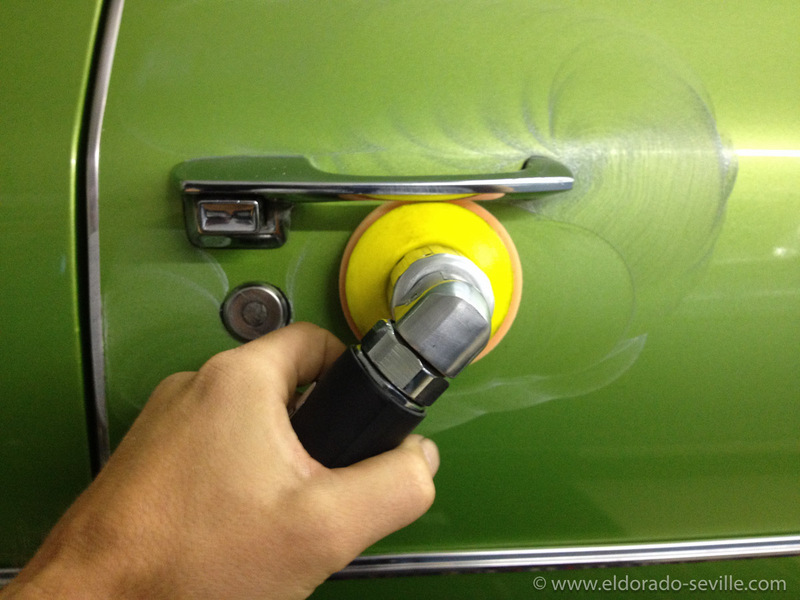 I´ve repaired the AC on my 67 and cleaned and detailed both cars for the show. 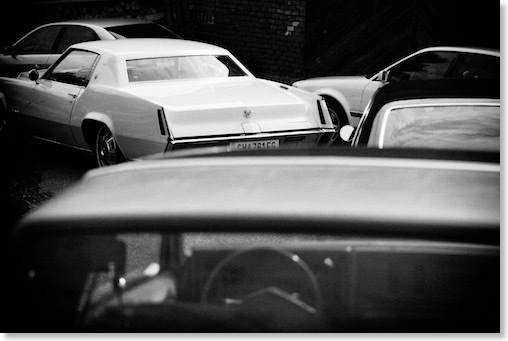 My friend Tayfun is also in town and we´ll do the same with his 81 Pimperado as well. 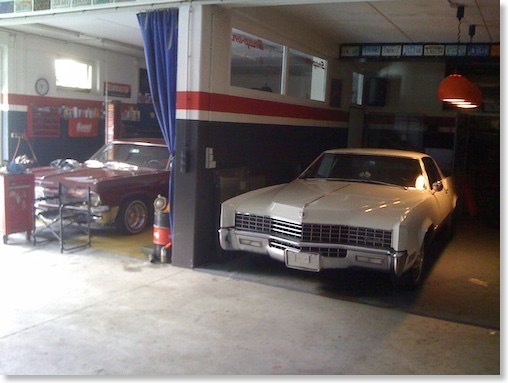 We´ve spent around 14 hours in the garage each day so far. 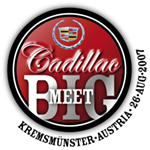 Cadillac Big Meet is coming up! 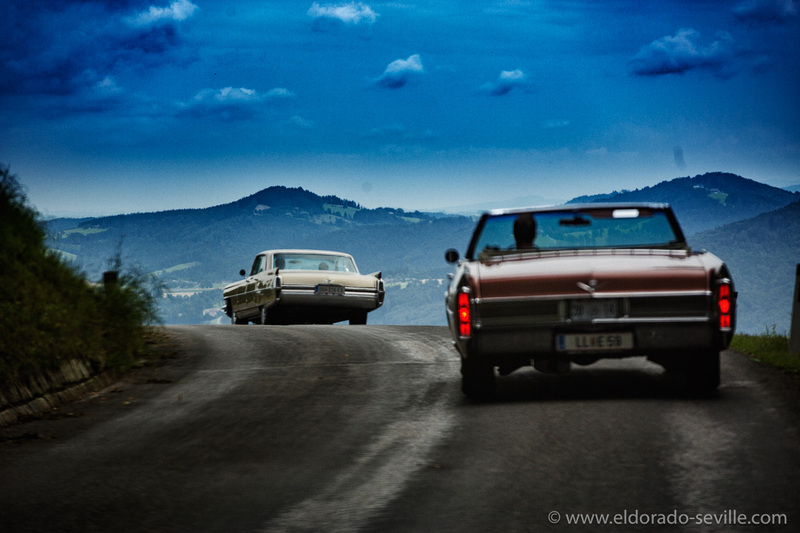 This year will feature an "Eldorado Special" and we are looking for everybody with an Eldorado to participate. 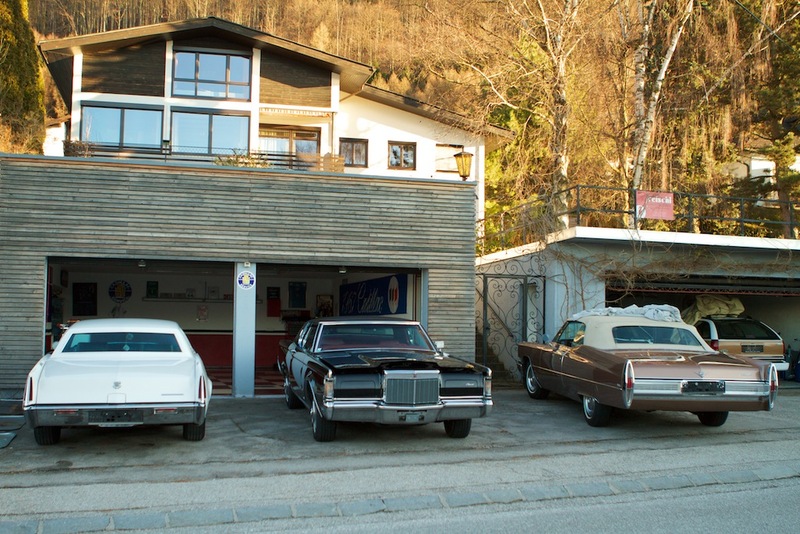 Of course all other Cadillacs are welcome as well. Today I had to shoot a car meet for a local TV station I´m working for as a cameraman. I took the 58 there. My friends Tayfun and Alex also drove to the show. 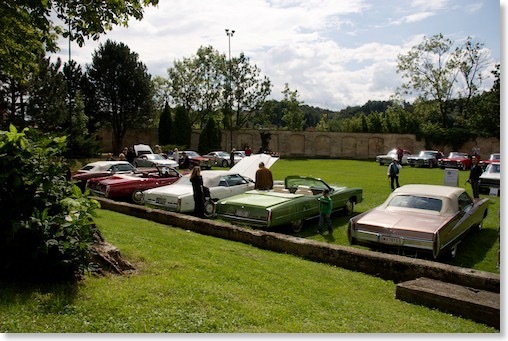 It was a very nice and fun meeting with 30 cars attending. Here is a picture gallery of some images we shot there. At work behind the camera with my colleague Hubert Huemer from BTV doing the interviews. My wife and I took the 58 to the first car show this season. 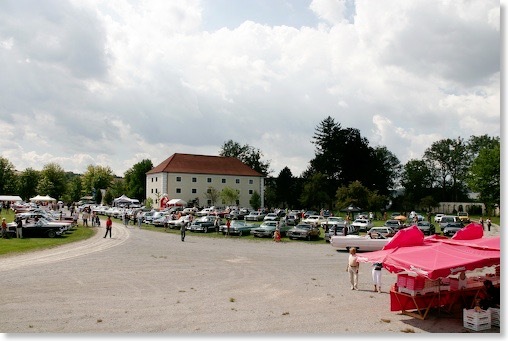 The Lions Club in Traun organized a Classic Car Meeting on a small lake in Traun/Austria. About 300 cars showed up - most of them were european brands. The 58 drew a lot of attention and we spent a nice afternoon there. We did not take many pictures which you can find here - the ones taken from the organizers can be found on their website. 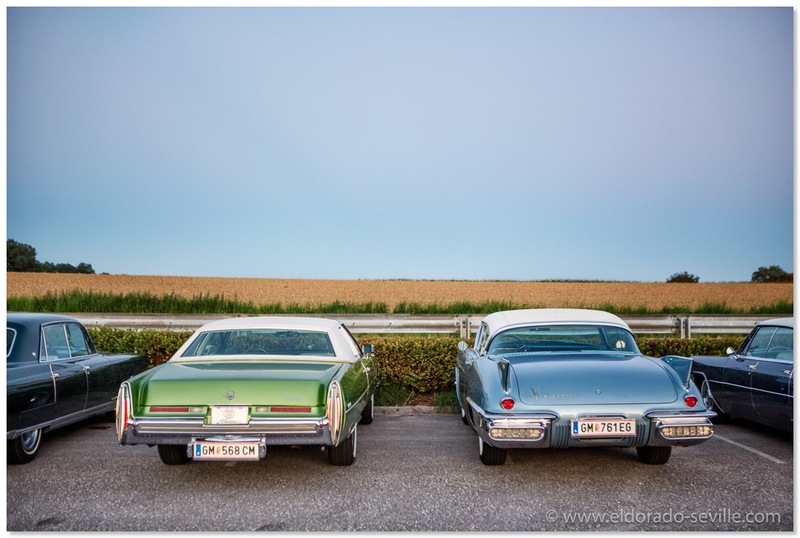 The Cadillac Big Meet is Europes largest and best Cadillac Meeting. You should not miss it! 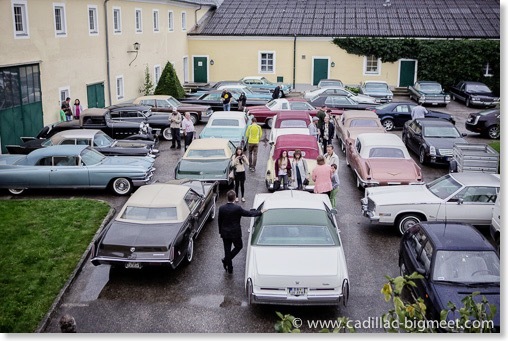 Cadillacs of all years get together at the Kremsegg Castle in the heart of Austria on August 26th. 2007 is the 4th edition of this meeting, and you should not miss it. I´m in the organization team and we are already working very hard to make this years edition the very best one we had so far. 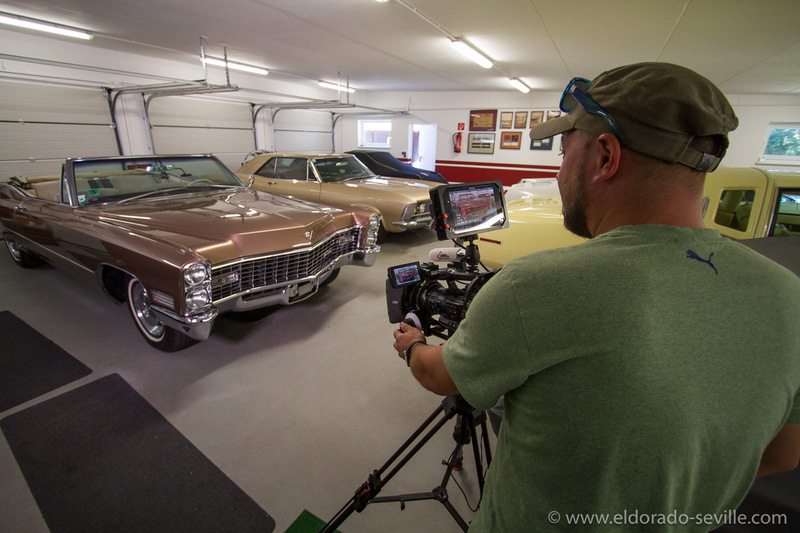 We will especially feature the 5 decades of the Eldorado and are trying to have at least on Eldorado of each year on the show field! 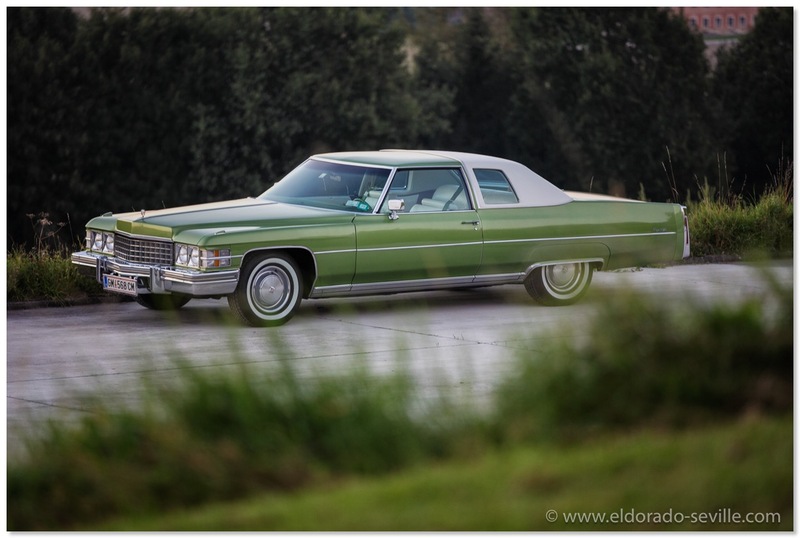 For more info go to the website of the Cadillac Big Meet!